2007-03-21 First worldwide family litigation filed litigation Critical https://patents.darts-ip.com/?family=26962700&utm_source=google_patent&utm_medium=platform_link&utm_campaign=public_patent_search&patent=US6814953(B2) "Global patent litigation dataset” by Darts-ip is licensed under a Creative Commons Attribution 4.0 International License. 2011-12-08 Assigned to DEY PHARMA, L.P. reassignment DEY PHARMA, L.P. CHANGE OF NAME (SEE DOCUMENT FOR DETAILS). Assignors: DEY, L.P.
2012-05-31 US case 2012-1428 filed litigation https://portal.unifiedpatents.com/litigation/Court%20of%20Appeals%20for%20the%20Federal%20Circuit/case/2012-1428 Source: Court of Appeals for the Federal Circuit Jurisdiction: Court of Appeals for the Federal Circuit "Unified Patents Litigation Data" by Unified Patents is licensed under a Creative Commons Attribution 4.0 International License. 2014-04-28 US case 2014-1434 filed litigation https://portal.unifiedpatents.com/litigation/Court%20of%20Appeals%20for%20the%20Federal%20Circuit/case/2014-1434 Source: Court of Appeals for the Federal Circuit Jurisdiction: Court of Appeals for the Federal Circuit "Unified Patents Litigation Data" by Unified Patents is licensed under a Creative Commons Attribution 4.0 International License. Bronchodilating compositions and methods are provided. The compositions are intended for administration as a nebulized aerosol. In certain embodiments, the compositions contain formoterol, or a derivative thereof. Methods for treatment, prevention, or amelioration of one or more symptoms of bronchoconstrictive disorders using the compositions provided herein are also provided. This application is a divisional application of U.S. application Ser. No. 09/887,281, to Banerjee et al., entitled “BRONCHODILATING COMPOSITIONS AND METHODS,” filed Jun. 22, 2001. This application also claims the benefit of priority under 35 U.S.C. §119(e) to U.S. provisional patent application Ser. No. 60/284,606; filed Apr. 17, 2001, to Pham et al., entitled “BRONCHODILATING COMPOSITIONS AND METHODS.” U.S. application Ser. No. 09/887,281 claims benefit of priority under 35 U.S.C. §119(e) to U.S. provisional patent application Ser. No. 60/284,606. The disclosures of the above-referenced applications are incorporated herein by reference in their entirety. Compositions and methods are provided relating to treatment, prevention, or amelioration of one or more symptoms of bronchoconstrictive disorders. In particular, the compositions and methods herein include formoterol, and/or derivatives thereof. The compositions are propellant-free, sterile unit dose or multidose inhalation solutions intended for administration via nebulization. Bronchoconstrictive disorders affect millions worldwide. Such disorders include asthma (including bronchial asthma, allergic asthma and intrinsic asthma, e.g., late asthma and airway hyper-responsiveness), chronic bronchitis and other chronic obstructive pulmonary diseases. Compounds having β2-adrenoreceptor agonist activity have been developed to treat these conditions. Such compounds include, but are not limited to, Albuterol (α1-(((1,1-dimethylethyl)amino)methyl)-4-hydroxy-1,3-benzenedimethanol); Bambuterol (dimethylcarbamic acid 5-(2-((1,1-dimethylethyl)amino)-1-hydroxyethyl)-1,3-phenylene ester); Bitolterol (4-methylbenzoic acid 4-(2-((1,1-dimethylethyl)amino)-1-hydroxyethyl)-1,2-phenylene ester); Broxaterol (3-bromo-α-(((1,1-dimethylethyl)amino)-methyl)-5-isoxazolemethanol); Isoproterenol (4-(1-hydroxy-2-((1-methylethyl)amino)ethyl)-1,2-benzenediol); Trimetoquinol (1,2,3,4-tetrahydro-1-((3,4,5-trimethoxyphenyl)methyl)-6,7-isoquinolinediol); Clenbuterol (4-amino-3,5-dichloro-α-(((1,1-diemthylethyl)amino)methyl)benzenemethanol); Fenoterol (5-(1-hydroxy-2-((2-(4-hydroxyphenyl)-1-methylethyl)-amino)ethyl)-1,3-benzenediol); Formoterol (2-hydroxy-5-((1RS)-1-hydroxy-2-(((1RS)-2-(p-methoxyphenyl)-1-methylethyl)amino)ethyl)formanilide); (R,R)-Formoterol; Desformoterol ((R,R) or (S,S)-3-amino-4-hydroxy-α-(((2-(4-methoxyphenyl)-1-methylethyl)amino)methyl)benzenemethanol); Hexoprenaline (4,4′-(1,6-hexanediyl)-bis(imino(1-hydroxy-2,1-ethanediyl)))bis-1,2-benzenediol); Isoetharine (4-(1-hydroxy-2-((1-methylethyl)amino)-butyl)-1,2-benzenediol); Isoprenaline (4-(1-hydroxy-2-((1-methylethyl)-amino)ethyl)-1,2-benzenediol); Metaproterenol (5-(1-hydroxy-2-((1-methylethyl)amino)ethyl)-1,3-benzenediol); Picumeterol (4-amino-3,5-dichloro-α-(((6-(2-(2-pyridinyl)ethoxy)hexyl)amino)methyl)benzenemethanol); Pirbuterol (α6-(((1,1-dimethylethyl)amino)methyl)-3-hydroxy-2,6-pyridinemethanol); Procaterol (((R*,S*)-(±)-8-hydroxy-5-(1-hydroxy-2-((1-methylethyl)amino)butyl)-2(1H)-quinolinone); Reproterol ((7-(3-((2-(3,5-dihydroxyphenyl)-2-hydroxyethyl)amino)propyl)-3,7-dihydro-1,3-dimethyl-1H-purine-2,6-dione); Rimiterol (4-(hydroxy-2-piperidinylmethyl)-1,2-benzenediol); Salbutamol ((±)-α1-(((1,1-dimethylethyl)amino)methyl)-4-hydroxy-1,3-benzenedimethanol); (R)-Salbutamol; Salmeterol ((±)-4-hydroxy-α1-(((6-(4-phenylbutoxy)hexyl)amino)methyl)-1,3-benzenedimethanol); (R)-Salmeterol; Terbutaline (5-(2-((1,1-dimethylethyl)amino)-1-hydroxyethyl)-1,3-benzenediol); Tulobuterol (2-chloro-α-(((1,1-dimethylethyl)amino)methyl)benzenemethanol); and TA-2005 (8-hydroxy-5-((1R)-1-hydroxy-2-(N-((1R)-2-(4-methoxyphenyl)-1-methylethyl)amino)ethyl)-carbostyril hydrochloride). These compounds are typically formulated for inhalation therapy. Aqueous or liquid formulations are preferred over solid formulations. Powdered formulations are more difficult to administer, particularly to the young and elderly who are most often the patients in need of such therapy. Compounds, such as formoterol, which has many desirable properties, are not adequately stable in aqueous solutions to be formulated as liquids. Hence there is a need for formulations of compounds, such as formoterol, in a form that can be conveniently administered and that are stable for extended periods of time. Therefore, it is an object herein to provide liquid formulations of μ2-adrenoreceptor agonist compounds. It is also an object herein to provide more stable formulations of others of these compounds. Compositions and methods for treatment, prevention, or amelioration of one or more symptoms of bronchoconstrictive disorders are provided. The compositions provided herein are stable solutions of a bronchodilating agent, or a derivative thereof, in a pharmacologically suitable fluid that contains water, that are stable during long term storage. The compositions are suitable for direct administration to a subject in need thereof. Pharmacologically suitable fluids include, but are not limited to, polar fluids, including protic fluids. In certain embodiments herein, the compositions are aqueous solutions. The compositions provided herein possess an estimated shelf-life of greater than 1, 2 or 3 months usage time at 25° C. and greater than or equal to 1, 2 or 3 years storage time at 5° C. In certain of these embodiments, using Arrhenius kinetics, >80% or >85% or >90% or >95% estimated bronchodilating agent remains after such storage. These compositions are particularly useful for administration via nebulization. In certain embodiments herein, the subject is a mammal. In other embodiments, the subject is a human. The compositions provided herein are formulated to remain stable over a relatively long period of time. For example, the compositions provided herein are stored between −15° C. and 25° C., or between 2° C. and 8° C., and remain stable for the desired time. In one embodiment, the compositions are stored at 5° C.
Among the bronchodilating agents for use herein are Albuterol (α1-(((1,1-dimethylethyl)amino)methyl)-4-hydroxy-1,3-benzenedimethanol); Bambuterol (dimethylcarbamic acid 5-(2-((1,1-dimethylethyl)amino)-1-hydroxyethyl)-1,3-phenylene ester); Bitolterol (4-methylbenzoic acid 4-(2-((1,1-dimethylethyl)amino)-1-hydroxyethyl)-1,2-phenylene ester); Broxaterol (3-bromo-α-(((1,1-dimethylethyl)amino)methyl)-5-isoxazolemethanol); Isoproterenol (4-(1-hydroxy-2-((1-methylethyl)amino)ethyl)-1,2-benzenediol); Trimetoquinol (1,2,3,4-tetrahydro-1-((3,4,5-trimethoxyphenyl)-methyl)-6,7-isoquinolinediol); Clenbuterol (4-amino-3,5-dichloro-α-(((1,1-diemthylethyl)amino)methyl)benzenemethanol); Fenoterol (5-(1-hydroxy-2-((2-(4-hydroxyphenyl)-1-methylethyl)amino)ethyl)-1,3-benzenediol); Formoterol (2-hydroxy-5-((1RS)-1-hydroxy-2-(((1RS)-2-(p-methoxyphenyl)-1-methylethyl)amino)ethyl)formanilide); (R,R)-Formoterol; Desformoterol ((R,R) or (S,S)-3-amino-4-hydroxy-α-(((2-(4-methoxyphenyl)-1-methylethyl)amino)methyl)benzenemethanol); Hexoprenaline (4,4′-(1,6-hexanediyl)-bis(imino(1-hydroxy-2,1-ethanediyl)))bis-1,2-benzenediol); Isoetharine (4-(1-hydroxy-2-((1-methylethyl)amino)butyl)-1,2-benzenediol); Isoprenaline (4-(1-hydroxy-2-((1-methylethyl)amino)ethyl)-1,2-benzenediol); Metaproterenol (5-(1-hydroxy-2-((1-methylethyl)amino)ethyl)-1,3-benzenediol); Picumeterol (4-amino-3,5-dichloro-α-(((6-(2-(2-pyridinyl)ethoxy)hexyl)-amino)methyl)benzenemethanol); Pirbuterol (α6-(((1,1-dimethylethyl)-amino)methyl)-3-hydroxy-2,6-pyridinemethanol); Procaterol (((R*,S*)-(±)-8-hydroxy-5-(1-hydroxy-2-((1-methylethyl)amino)butyl)-2(1H)-quinolinone); Reproterol ((7-(3-((2-(3,5-dihydroxyphenyl)-2-hydroxyethyl)amino)-propyl)-3,7-dihydro-1,3-dimethyl-1H-purine-2,6-dione); Rimiterol (4-(hydroxy-2-piperidinylmethyl)-1,2-benzenediol); Salbutamol ((±)-α1-(((1,1-dimethylethyl)amino)methyl)-4-hydroxy-1,3-benzenedimethanol); (R)-Salbutamol; Salmeterol ((±)-4-hydroxy-α1-(((6-(4-phenylbutoxy)hexyl)-amino)methyl)-1,3-benzenedimethanol); (R)-Salmeterol; Terbutaline (5-(2-((1,1-dimethylethyl)amino)-1-hydroxyethyl)-1,3-benzenediol); Tulobuterol (2-chloro-α-(((1,1-dimethylethyl)amino)methyl)benzenemethanol); and TA-2005 (8-hydroxy-5-((1R)-1-hydroxy-2-(N-((1R)-2-(4-methoxyphenyl)-1-methylethyl)amino)ethyl)carbostyril hydrochloride). Formoterol for use in the compositions and methods provided herein includes 2-hydroxy-5-((1RS)-1-hydroxy-2-(((1RS)-2-(p-methoxyphenyl)-1-methylethyl)amino)ethyl)formanilide; or a stereoisomer thereof; and also includes the single enantiomers 2-hydroxy-5-((1S)-1-hydroxy-2-(((1S)-2-(p-methoxyphenyl)-1-methylethyl)amino)ethyl)formanilide and 2-hydroxy-5-((1R)-1-hydroxy-2-(((1R)-2-(p-methoxyphenyl)-1-methylethyl)-amino)ethyl) formanilide. In certain embodiments, the compositions are administered via nebulization. Administration of a nebulized aerosol is preferred over the use of dry powders for inhalation in certain subject populations, including pediatric and geriatric groups. In one embodiment, the compositions for use in the methods provided herein contain a pharmaceutically acceptable derivative of formoterol. In another embodiment, the compositions for use in the methods provided herein contain a pharmaceutically acceptable salt of formoterol. Pharmaceutically acceptable salts include, but are not limited to, salts of mineral acids, such as but not limited to hydrochlorides and sulfates; and salts of organic acids, such as but not limited to acetates, lactates, malates, tartrates, citrates, ascorbates, succinates, butyrates, valerates and fumarates. In one embodiment, the compositions for use in the methods provided herein contain formoterol fumarate or formoterol fumarate dihydrate. In another embodiment, the compositions for use in the methods provided herein contain formoterol tartrate. Also provided herein are combinations containing a composition provided herein and a nebulizer. The combinations can be packaged as kits, which optionally contain other components, including instructions for use of the nebulizer. Any nebulizer is contemplated for use in the kits and methods provided herein. In particular, the nebulizers for use herein nebulize liquid formulations, including the compositions provided herein, containing no propellant. The nebulizer may produce the nebulized mist by any method known to those of skill in the art, including, but not limited to, compressed air, ultrasonic waves, or vibration. The nebulizer may further have an internal baffle. The internal baffle, together with the housing of the nebulizer, selectively removes large droplets from the mist by impaction and allows the droplets to return to the reservoir. The fine aerosol droplets thus produced are entrained into the lung by the inhaling air/oxygen. Methods for the treatment, prevention, or amelioration of one or more symptoms of bronchoconstrictive disorders, including, but not limited to, asthma, including, but not limited to, bronchial asthma, allergic asthma and intrinsic asthma, e.g., late asthma and airway hyper-responsiveness; chronic bronchitis; and other chronic obstructive pulmonary diseases are provided. The methods involve administering an effective amount of a pharmaceutical composition provided herein to a subject in need of such treatment. Articles of manufacture, containing packaging material, a composition provided herein, which is useful for treatment, prevention or amelioration of one or more symptoms of diseases or disorders associated with undesired and/or uncontrolled bronchoconstriction, and a label that indicates that the composition is used for treatment, prevention or amelioration of one or more symptoms of diseases or disorders associated with undesired and/or uncontrolled bronchoconstriction, are also provided. Unless defined otherwise, all technical and scientific terms used herein have the same meaning as is commonly understood by one of ordinary skill in the art to which this invention belongs. All patents, applications, published applications and other publications are incorporated by reference in their entirety. In the event that there are a plurality of definitions for a term herein, those in this section prevail unless stated otherwise. As used herein, formoterol refers to 2-hydroxy-5-((1RS)-1-hydroxy-2-(((1RS)-2-(p-methoxyphenyl)-1-methylethyl)amino)ethyl)formanilide; or a stereoisomer thereof. The term formoterol also refers to the single enantiomers 2-hydroxy-5-((1S)-1-hydroxy-2-(((1S)-2-(p-methoxyphenyl)-1-methylethyl)amino)ethyl)formanilide and 2-hydroxy-5-((1R)-1-hydroxy-2-(((1R)-2-(p-methoxyphenyl)-1-methylethyl)amino)ethyl)formanilide. As used herein, formoterol fumarate refers to a salt of formoterol having the formula (formoterol)*½fumarate. As used herein, formoterol free base refers to the neutral, anhydrous form of formoterol. Thus, a recitation that a composition contains, e.g., 59 μg/mL of formoterol free base means that the composition contains 59 μg/mL of neutral, anhydrous formoterol. Such compositions may be prepared using a derivative of formoterol. As used herein, an aerosol is liquid or particulate matter dispersed in air. Aerosols include dispersions of liquids, including aqueous and other solutions, and solids, including powders, in air. As used herein, a nebulized solution refers to a solution that is dispersed in air to form an aerosol. Thus, a nebulized solution is a particular form of an aerosol. As used herein, a nebulizer is an instrument that is capable of generating very fine liquid droplets for inhalation into the lung. Within this instrument, the nebulizing liquid or solution is atomized into a mist of droplets with a broad size distribution by methods known to those of skill in the art, including, but not limited to, compressed air, ultrasonic waves, or a vibrating orifice. Nebulizers may further contain, e.g., a baffle which, along with the housing of the instrument, selectively removes large droplets from the mist by impaction. Thus, the mist inhaled into the lung contains fine aerosol droplets. As used herein, a pharmacologically suitable fluid is a solvent suitable for pharmaceutical use which is not a liquified propellant gas. Exemplary pharmacologically suitable fluids include polar fluids, including protic fluids such as water. As used herein, a combination refers to any association between two or among more items. As used herein, fluid refers to any composition that can flow. Fluids thus encompass compositions that are in the form of semi-solids, pastes, solutions, aqueous mixtures, gels, lotions, creams and other such compositions. As used herein, a mixture is a mutual incorporation of two or more substances, without chemical union, the physical characteristics of each of the components being retained. As used herein, the stability of a composition provided herein refers to the length of time at a given temperature that is greater than 80%, 85%, 90% or 95% of the initial amount of active ingredient, e.g., formoterol, is present in the composition. Thus, for example, a composition that is stable for 30 days at 25° C. would have greater than 80%, 85%, 90% or 95% of the initial amount of active ingredient present in the composition at 30 days following storage at 25° C.
As used herein, pharmaceutically acceptable derivatives of a compound include salts, esters, enol ethers, enol esters, acids, bases, solvates, hydrates or prodrugs thereof. Such derivatives may be readily prepared by those of skill in this art using known methods for such derivatization. The compounds produced may be administered to animals or humans without substantial toxic effects and either are pharmaceutically active or are prodrugs. Pharmaceutically acceptable salts include, but are not limited to, amine salts, such as but not limited to N,N′-dibenzylethylenediamine, chloroprocaine, choline, ammonia, diethanolamine and other hydroxyalkylamines, ethylenediamine, N-methylglucamine, procaine, N-benzylphenethylamine, 1-para-chlorobenzyl-2-pyrrolidin-1′-ylmethyl-benzimidazole, diethylamine and other alkylamines, piperazine and tris(hydroxy-methyl)aminomethane; alkali metal salts, such as but not limited to lithium, potassium and sodium; alkali earth metal salts, such as but not limited to barium, calcium and magnesium; transition metal salts, such as but not limited to zinc; and other metal salts, such as but not limited to sodium hydrogen phosphate and disodium phosphate; and also including, but not limited to, salts of mineral acids, such as but not limited to hydrochlorides and sulfates; and salts of organic acids, such as but not limited to acetates, lactates, malates, tartrates, citrates, ascorbates, succinates, butyrates, valerates and fumarates. Pharmaceutically acceptable esters include, but are not limited to, alkyl, alkenyl, alkynyl, aryl, heteroaryl, aralkyl, heteroaralkyl, cycloalkyl and heterocyclyl esters of acidic groups, including, but not limited to, carboxylic acids, phosphoric acids, phosphinic acids, sulfonic acids, sulfinic acids and boronic acids. Pharmaceutically acceptable enol ethers include, but are not limited to, derivatives of formula C═C(OR) where R is hydrogen, alkyl, alkenyl, alkynyl, aryl, heteroaryl, aralkyl, heteroaralkyl, cycloalkyl and heterocyclyl. Pharmaceutically acceptable enol esters include, but are not limited to, derivatives of formula C═C(OC(O)R) where R is hydrogen, alkyl, alkenyl, alkynyl, aryl, heteroaryl, aralkyl, heteroaralkyl, cycloalkyl and heterocyclyl. Pharmaceutically acceptable solvates and hydrates are complexes of a compound with one or more solvent or water molecule, preferably 1 to about 100, more preferably 1 to about 10, most preferably one to about 2, 3 or 4, solvent or water molecules. Formoterol salts and hydrates are used in certain embodiments herein. As used herein, treatment means any manner in which one or more of the symptoms of a condition, disorder or disease are ameliorated or otherwise beneficially altered. Treatment also encompasses any pharmaceutical use of the compositions herein, such as use for treating cancer. As used herein, amelioration of the symptoms of a particular disorder by administration of a particular pharmaceutical composition refers to any lessening, whether permanent or temporary, lasting or transient that can be attributed to or associated with administration of the composition. As used herein, a prodrug is a compound that, upon in vivo administration, is metabolized or otherwise converted to the biologically, pharmaceutically or therapeutically active form of the compound. To produce a prodrug, the pharmaceutically active compound is modified such that the active compound will be regenerated by metabolic processes. The prodrug may be designed to alter the metabolic stability or the transport characteristics of a drug, to mask side effects or toxicity, to improve the flavor of a drug or to alter other characteristics or properties of a drug. By virtue of knowledge of pharmacodynamic processes and drug metabolism in vivo, those of skill in this art, once a pharmaceutically active compound is known, can design prodrugs of the compound (see, e., Nogrady (1985) Medicinal Chemistry A Biochemical Approach, Oxford University Press, New York, pages 388-392). It is to be understood that the compounds for use in the compositions and methods provided herein may contain chiral centers. Such chiral centers may be of either the (R) or (S) configuration, or may be a mixture thereof. Thus, the compounds for use in the compositions provided herein may be enantiomerically pure, or be stereoisomeric or diastereomeric mixtures. It is to be understood that the chiral centers of the compounds provided herein may undergo epimerization in vivo. Thus, one of skill in the art will recognize that administration of a compound in its (R) form is equivalent, for compounds that undergo epimerization in vivo, to administration of the compound in its (S) form. As used herein, bronchoconstriction refers to a reduction in the caliber of a bronchus or bronchi. As used herein, undesired and/or uncontrolled bronchoconstriction refers to bronchoconstriction that results in or from a pathological symptom or condition. Pathological conditions include, but are not limited to, asthma and chronic obstructive pulmonary disease (COPD). Pathological symptoms include, but are not limited to, asthma and COPD. As used herein, the statement that a composition is stable during “long term storage” means that the composition is suitable for administration to a subject in need thereof when it has an estimated shelf-life of greater than 1, 2 or 3 months usage time at 25° C. and greater than or equal to 1, 2 or 3 years storage time at 5° C. In certain embodiments herein, using Arrhenius kinetics, >80% or >85% or >90% or >95% estimated bronchodilating agent remains after such storage. 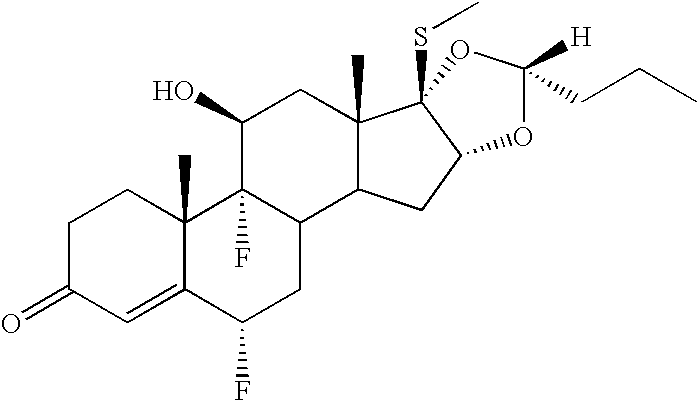 Formoterol (2-hydroxy-5-((1RS)-1-hydroxy-2-(((1RS)-2-(p-methoxyphenyl)-1-methylethyl)amino)ethyl)formanilide) is derived from adrenaline and, as noted above, is used as a β2-stimulator in inhalation therapy of respiratory diseases, particularly for the treatment of bronchial asthma. It has been reported that in patients with reversible obstructive respiratory diseases, formoterol has a bronchodilatory effect. This effect has a relatively rapid onset (approximately 1-3 minutes) and a relatively long duration (greater than 12 hours). Formoterol inhibits the release of leukotrienes and other messenger substances involved with inflammation, such as histamines. In addition, formoterol may bring about a hyperglycaemic activity. To date, formoterol has been formulated as a dry powder and administered via devices such as the Turbuhaler® and the Aerolizer®. See, e.g., Seberova et al. (2000) Respir. Med. 94(6):607-611; Lotvall et al. (1999) Can. Respir. J. 6(5):412-416; Campbell et al. (1999) Respir. Med. 93(4):236-244; Nightingale et al. (1999) Am. J. Respir. Crit. Care Med. 159(6):1786-1790; Lecaillon et al. (1999) Eur. J. Clin. Pharmacol. 55(2):131-138; Bartow et al. (1998) Drugs 55(2):303-322; Ekstrom et !al. (1998) Respir. Med. 92(8):1040-1045; Ringdal et al. (1998) Respir. Med. 92(8):1017-1021; Totterman et al. (1998) Eur. Respir. J. 12(3):573-579; Palmqvist et al. (1997) Eur. Respir. J. 10(11):2484-2489; Nielsen et al. (1997) Eur. Respir. J. 10(9):2105-2109; Ullman et al. (1996) Allergy 51(10):745-748; Selroos et al. (1996) Clin. Immunother. 6:273-299; and Schreurs et al. (1996) Eur. Respir. J. 9(8):1678-1683. Formoterol is also available as a tablet and a dry syrup in certain areas of the world (eq., Atock®, marcketed by Yamanouchi Pharmaceutical Co. Ltd., Japan). Formoterol formulations are also available in other areas (ea., Europe and U.S.) for propellant-based metered dose inhalers and dry powder inhalers (e.g., Turbuhaler®, Aerolizer® and Foradil Aerolizer®). None of these formulations are water based. Sterile, stable, aqueous based inhalation solutions of formoterol for nebulization are not available, nor have they been reported. Compositions containing formoterol in combination with other active ingredients have been disclosed. See, eq., U.S. Pat. Nos. 6,004,537, 5,972,919 and 5,674,860 (formoterol and budenoside), 5,668,110, 5,683,983, 5,677,280 and 5,654,276 (formoterol and IL-5 inhibitors), 6,136,603 (formoterol and antisense modulators of IL-5), 5,602,110 (formoterol and millrinone), 5,525,623 (formoterol and a tryptase inhibitor), 5,691,336, 5,877,191, 5,929,094, 5,750,549 and 5,780,467 (formoterol and a tachykinin receptor antagonist); and International Patent Application Publication Nos. WO 99/00134 (formoterol and rofleponide) and WO 99/36095 (formoterol and a dopamine D2 receptor agonist). Other compositions containing formoterol have been disclosed in U.S. Pat. Nos. 5,677,809, 6,126,919, 5,733,526, 6,071,971, 6,068,833, 5,795,564, 6,040,344, 6,041,777, 5,874,481, 5,965,622 and 6,161,536. U.S. Pat. No. 6,150,418 discloses a “liquid active substance concentrate” containing formoterol in the form of its free base or in the form of one of the pharmacologically acceptable salts or addition products (adducts) thereof as active substance. This “liquid active substance concentrate” is reported to be a concentrated (i.e., greater than 10 mg/mL, preferably 75 to 500 mg/mL) solution or suspension that is stable for a period of several months possibly up to several years without any deterioration in the pharmaceutical quality. This patent teaches that it is the high concentration that allows for the stability of the concentrate. The “liquid active substance concentrate” is not suitable for direct administration to a patient. U.S. Pat. No. 6,040,344 discloses an aqueous aerosol formulation of formoterol tartrate for use in a nebulizer. This patent states that the formulation disclosed therein is not attractive for long term storage. Pharmaceutical compositions containing a β2-adrenoreceptor agonist for administration via nebulization are provided. The compositions are sterile filtered and filled in vials, including unit dose vials providing sterile unit dose formulations which are used in a nebulizer and suitably nebulized. Each unit dose vial is sterile and is suitably nebulized without contaminating other vials or the next dose. The unit dose vials are formed in a form-fill-seal machine or by any other suitable method known to those of skill in the art. The vials may be made of plastic materials that are suitably used in these processes. For example, plastic materials for preparing the unit dose vials include, but are not limited to, low density polyethylene, high density polyethylene, polypropylene and polyesters. In one embodiment, the plastic material is low density polyethylene. In one embodiment, the β2-adrenoreceptor agonist is formoterol, or a pharmaceutically acceptable derivative thereof. In other embodiments, the formoterol for use in the compositions provided herein is formoterol fumarate. Formoterol refers to 2-hydroxy-5-((1RS)-1-hydroxy-2-(((1RS)-2-(p-methoxy-phenyl)-1-methylethyl)amino)ethyl)formanilide; or a stereoisomer thereof. The term formoterol also refers herein to the single enantiomers 2-hydroxy-5-((1S)-1-hydroxy-2-(((1S)-2-(p-methoxyphenyl)-1-methylethyl)amino)ethyl)formanilide and 2-hydroxy-5-((1R)-1-hydroxy-2-(((1R)-2-(p-methoxyphenyl)-1-methylethyl)amino)-ethyl)formanilide. In one embodiment, the compositions contain formoterol free base at a concentration of about 5 μg/mL to about 2 mg/mL. In other embodiments, the maximum concentration of formoterol free base in the compositions is 1.5 mg/mL. In further embodiments, the concentration of formoterol free base in the compositions is about 10 μg/mL to about 1 mg/mL, or about 50 μg/mL to about 200 μg/mL. In other embodiments, the compositions contain formoterol fumarate at a concentration of about 80 μg/mL up to about 175 to 200 μg/mL. In further embodiments, the compositions contain formoterol fumarate at a concentration of about 90 μg/mL up to about 125 to 150 μg/mL. The formoterol fumarate is formulated, in certain compositions provided herein, at a concentration of about 100 μg/mL. The formoterol fumarate is formulated, in other compositions provided herein, at a concentration of about 85 μg/mL or about 170 μg/mL. In one embodiment, the formoterol fumarate is formulated for single dosage administration via nebulization at a concentration of about 100 μg/mL. In another embodiment, the compositions contain formoterol free base at a concentration of about 40 to about 150 μg/mL, particularly about 59 or about 118 μg/mL. The compositions containing the β2-adrenoreceptor agonist, including formoterol, are formulated with a pharmacologically suitable fluid. Pharmacologically suitable fluids include, but are not limited to, polar solvents, including, but not limited to, compounds that contain hydroxyl groups or other polar groups. Such solvents include, but are not limited to, water or alcohols, such as ethanol, isopropanol, and glycols including propylene glycol, polyethylene glycol, polypropylene glycol, glycol ether, glycerol and polyoxyethylene alcohols. Polar solvents also include protic solvents, including, but not limited to, water, aqueous saline solutions with one or more pharmaceutically acceptable salt(s), alcohols, glycols or a mixture thereof. For a saline solution as the solvent or as a component othereof, particularly suitable salts are those which display no or only negligible pharmacological activity after administration. In the embodiments herein, the compositions have a pH of about 2.0 to about 8.0. In other embodiments, the compositions have a pH of about 4.0 to about 6.0, or about 4.5 to about 5.5. In certain of the above embodiments, the compositions are formulated at a pH of about 4, 4.4 or 4.6 up to about 5.5, 5.7 or 6. In other embodiments, the pH is about 5.0. It has been found herein that the rate constant for decomposition of an aqueous solution of formoterol is dependent on pH. The rate constant (kobs) at 60° C. at a pH of 3, 4, 5 and 7 is approximately 0.62, 0.11, 0.044 and 0.55 day−1, respectively. Therefore, the decomposition of formoterol in aqueous solution at 60° C. at a buffer concentration of 5 mM and an ionic strength of 0.05 is slowest at a pH of about 5.0. The solubility of formoterol in aqueous solution has been found herein to be dependent on pH. Thus, at a pH of between about 5 and about 7, the aqueous solubility of formoterol at ambient temperature is approximately 2.2 mg/mL. At a pH of about 4, the aqueous solubility of formoterol at ambient temperature is approximately 3 mg/mL, while at a pH of about 3, the aqueous solubility of formoterol at ambient temperature is about 4.8 mg/mL. The solubility of formoterol in pure water, for example, high performance liquid chromatography (HPLC) water, at ambient temperature is approximately 2 mg/mL. In other of the above embodiments, the compositions further contain a buffer, including, but not limited to, citric acid/phosphate, acetate, barbital, borate, Britton-Robinson, cacodylate, citrate, collidine, formate, maleate, Mcllvaine, phosphate, Prideaux-Ward, succinate, citrate-phosphate-borate (Teorell-Stanhagen), veronal acetate, MES (2-(N-morpholino)ethanesulfonic acid), BIS-TRIS (bis(2-hydroxyethyl)iminotris(hydroxymethyl)methane), ADA (N-(2-acetamido)-2-iminodiacetic acid), ACES (N-(carbamoylmethyl)-2-aminoethanesulfonic acid), PIPES (piperazirie-N,N′-bis(2-ethanesulfonic acid)), MOPSO (3-(N-morpholino)-2-hydroxypropanesulfonic acid), BIS-TRIS PROPANE (1,3-bis(tris(hydroxymethyl)methylamino)propane), BES (N,N-bis(2-hydroxyethyl)-2-aminoethanesulfonic acid), MOPS (3-(N-morpholino)propanesulfonic acid), TES (N-tris(hydroxymethyl)methyl-2-aminoethanesulfonic acid), HEPES (N-(2-hydroxyethyl)piperazine-N′-(2-ethanesulfonic acid), DIPSO (3-(N,N-bis(2-hydroxyethyl)amino)-2-hydroxypropanesulfonic acid), MOBS (4-(N-morpholino)butanesulfonic acid), TAPSO (3-(N-tris(hydroxymethyl)methylamino)-2-hydroxypropanesulfonic acid), TRIZMAO (tris(hydroxymethylaminomethane), HEPPSO (N-(2-hydroxyethyl)piperazine-N′-(2-hydroxypropanesulfonic acid), POPSO (piperazine-N,N′-bis(2-hydroxypropanesulfonic acid)), TEA (triethanolamine), EPPS (N-(2-hydroxyethyl)piperazine-N′-(3-propanesulfonic acid), TRICINE (N-tris(hydroxymethyl)methylglycine), GLY-GLY (glycylglycine), BICINE (N;N-bis(2-hydroxyethyl)glycine), HEPBS (N-(2-hydroxyethyl)piperazine-N′-(4-butanesulfonic acid)), TAPS (N-tris(hydroxymethyl)methyl-3-aminopropanesulfonic acid), AMPD (2-amino-2-methyl-1,3-propanediol), and/or any other buffers known to those of skill in the art. In one embodiment, the buffer is citric acid/phosphate buffer, acetate buffer, citrate buffer or phosphate buffer. In another embodiment, the buffer is a citrate buffer (citric acid/sodium citrate). The buffer concentration has been found herein to affect the stability of the composition. Buffer concentrations for use herein include from about 0 or 0.01 mM to about 150 mM, or about 1 mM to about 20 mM. In one embodiment, the buffer concentration is about 5 mM. In another embodiment, the buffer concentration is about 1 mM to about 50 mM, or about 20 mM. The kinetic-pH profile of formoterol is dependent on buffer concentration. At low and approximately neutral conditions, increasing the buffer concentration from 5 mM to 20 mM increased the rate constant of decomposition significantly. However, no noticeable differences in rate constant were observed in the pH region of about 4.5 to about 5.5 with increasing buffer concentration from 5 mM to 20 mM. The particular buffer and buffer concentration of a given composition for long term storage provided herein may be determined empirically using standard stability assays well known to those of skill in the art (see, e.g., the Examples). The ionic strength of the compositions provided herein also has been found herein to affect the stability of the composition. Ionic strengths of the compositions provided herein are from about 0 to about 0.4, or from about 0.05 to about 0.16. Compositions having a lower ionic strength exhibit improved stability over formulations having higher strength of 0.2. The particular ionic strength of a given composition for long term storage provided herein may be determined empirically using standard stability assays well known to those of skill in the art (see, eq., the Examples). In embodiments where the pharamacogically suitable fluid is a saline solution, tonicity adjusting agents may be added to provide the desired ionic strength. Tonicity adjusting agents for use herein include those which display no or only negligible pharmacological activity after administration. Both inorganic and organic tonicity adjusting agents may be used in the compositions provided herein. Tonicity adjusting agents include, but are not limited to, ammonium carbonate, ammonium chloride, ammonium lactate, ammonium nitrate, ammonium phosphate, ammonium sulfate, ascorbic acid, bismuth sodium tartrate, boric acid, calcium chloride, calcium disodium edetate, calcium gluconate, calcium lactate, citric acid, dextrose, diethanolamine, dimethylsulfoxide, edetate disodium, edetate trisodium monohydrate, fluorescein sodium, fructose, galactose, glycerin, lactic acid, lactose, magnesium chloride, magnesium sulfate, mannitol, polyethylene glycol, potassium acetate, potassium chlorate, potassium chloride, potassium iodide, potassium nitrate, potassium phosphate, potassium sulfate, propylene glycol, silver nitrate, sodium acetate, sodium bicarbonate, sodium biphosphate, sodium bisulfite, sodium borate, sodium bromide, sodium cacodylate, sodium carbonate, sodium chloride, sodium citrate, sodium iodide, sodium lactate, sodium metabisulfite, sodium nitrate, sodium nitrite, sodium phosphate, sodium propionate, sodium succinate, sodium sulfate, sodium sulfite, sodium tartrate, sodium thiosulfate, sorbitol, sucrose, tartaric acid, triethanolamine, urea, urethan, uridine and zinc sulfate. In certain embodiments, the tonicity adjusting agent is sodium chloride, which is present at a concentration of from about 0 mg/mL to about 10, 15 or 20 mg/mL. In further embodiments, the compositions contain sodium chloride at a concentration of from about 0 mg/mL to about 7.5 mg/mL. In another embodiment, the compositions contain sodium chloride at a concentration of 0 mg/mL, 1.5 mg/mL, 6.8 mg/mL or 7.5 mg/mL. In these embodiments, the pharmacologically suitable fluid is aqueous saline. The storage temperature of the compositions provided herein also has been found herein to affect the stability of the composition. Compositions stored at a lower temperature exhibit improved stability over formulations stored at higher temperatures. The effect of temperature on the rate constant of decomposition at pH5, a buffer concentration of 5 mM, and an ionic strength of 0.05, was linear according to Arrhenius kinetics, i.e., when Ln kobs was plotted against 1/T, where T is the temperature in degree Kelvin. The estimated shelf-life of formoterol in the compositions provided herein is significantly greater than that reported for known formoterol compositions. The estimated shelf-life of formoterol in the compositions provided herein is about 6.2 years at 5° C. and about 7.5 months at 25° C. The estimated formoterol concentrations in the compositions provided herein as a function of storage time at 5° C. and usage time at 25° C. was determined. It is estimated that greater than 90% of the initial formoterol present in the composition remains after 3 months of usage time at 25° C. and 3 years of storage time at 5° C. as well as after 0.5 months of usage time at 25° C. and 1 year of storage time at 5° C.
In one embodiment, the compositions provided herein are prepared containing formoterol fumarate at a nominal concentration of 0.1 mg/mL at the indicated pH and citric acid/phosphate buffer concentrations. The solutions were stored at 60° C. In these compositions, formoterol is relatively more stable at a pH from about 4 to about 5, and is also more stable at lower buffer concentration. The compositions provided herein also may include excipients and additives. The particular excipient or additive for use in the compositions for long term storage provided herein may be determined empirically using methods well known to those of skill in the art (see, e., the Examples). Excipients and additives are any pharmacologically suitable and therapeutically useful substance which is not an active substance. Excipients and additives generally have no pharmacological activity, or at least no undesirable pharmacological activity. The excipients and additives include, but are not limited to, surfactants, stabilizers, complexing agents, antioxidants, or presevatives which prolong the duration of use of the finished pharmaceutical formulation, flavorings, vitamins, or other additives known in the art. Complexing agents include, but are not limited to, ethylenediaminetetraacetic acid (EDTA) or a salt thereof, such as the disodium salt, citric acid, nitrilotriacetic acid and the salts thereof. In one embodiment, the complexing agent is EDTA. Preservatives include, but are not limited to, those that protect the solution from contamination with pathogenic particles, including benzalkonium chloride or benzoic acid, or benzoates such as sodium benzoate. Antioxidants include, but are not limited to, vitamins, provitamins, ascorbic acid, vitamin E or salts or esters thereof. The compositions provided herein also may include a cosolvent, which increases the solubility of additives or the active ingredient(s). The particular cosolvent for use in the compositions for long term storage provided herein may be determined empirically using methods well known to those of skill in the art (see, e.g., the Examples). Cosolvents for use herein include, but are not limited to, hydroxylated solvents or other polar solvents, such as alcohols such as isopropyl alcohol, glycols such as propylene glycol, polyethylene glycol, polypropylene glycol, glycol ether, glycerol, and polyoxyethylene alcohols. The preparation of the compounds used in the compositions provided herein is described below. Any such compound or similar compound may be synthesized according to a method discussed in general below or by only minor modification of the methods by selecting appropriate starting materials. Formoterol may be prepared according to the method disclosed in U.S. Pat. No. 3,994,974. Briefly, 4-benzyloxy-3-nitro-α-bromoacetophenone is reacted with N-benzyl-N-(1-methyl-2-p-methoxyphenylethyl)amine to form the α-aminoacetophenone. This compound was subjected to the following series of reactions: (i) reduction of the ketone with sodium borohydride; (ii) reduction of the nitro group with aqueous hydrochloric acid and iron powder; (iii) amine formylation with acetic anhydride and formic acid; and (iv) catalytic reduction over 10% palladium on carbon to afford formoterol free base. Crystallization of the Y.2 fumarate salt from ethanol provides (formoterol)*½fumarate. The individual enantiomers of formoterol, 2-hydroxy-5-((1S)-1-hydroxy-2-(((1S)-2-(p-methoxyphenyl)-1-methylethyl)amino)ethyl)-formanilide and 2-hydroxy-5-((1R)-1-hydroxy-2-(((1R)-2-(p-methoxy-phenyl)-1-methylethyl)amino)ethyl)formanilide, may be prepared by the method disclosed in U.S. Pat. No. 6,040,344. Briefly, reaction of optically pure 4-benzyloxy-3-formamidostyrene oxide with an optically pure 4-methoxy-α-methyl-N-(phenylmethyl)benzeneethanamine, followed by debenzylation, affords the desired enantiomer of formoterol. Debenzylation may be accomplished by reduction with hydrogen gas in the presence of a noble metal catalyst, such as palladium on carbon. The required optically pure 4-benzyloxy-3-formamidostyrene oxide may be prepared from 4-benzyloxy-3-nitro-α-bromoacetophenone by (i) reduction with vorane in the presence of an optically pure aminoindanol, (ii) hydrogenation over platinum oxide catalyst, (iii) formylation with formic acid and acetic anhydride, and (iv) epoxide formation in the presence of potassium carbonate. The required optically pure 4-methoxy-α-methyl-N-(phenylmethyl)-benzeneethanamine may be prepared from 4-methoxyphenylacetone by (i) reductive amination with benzylamine in the presence of hydrogen and a platinum catalyst, and (ii) crystallization of the desired optically pure amine from the resulting racemic mixture as its mandelic acid salt. The compositions provided herein are prepared by procedures well known to those of skill in the art. For example, a formoterol fumarate solution may be prepared by the procedure of EXAMPLE 1. Briefly, a buffer solution having a pH and ionic strength of interest herein is prepared. In one embodiment, the buffer is a mixture of citric acid and sodium citrate, with sodium chloride added to achieve the desired ionic strength. Formoterol fumarate dihydrate is added to the buffer solution with agitation to produce a solution of the desired formoterol concentration. Exemplary formoterol concentrations are 0.17 g formoterol fumarate dihydrate/2 L and 0.34 g formoterol fumarate dihydrate/2 L buffer. Standard physiological, pharmacological and biochemical procedures are available for testing the compositions provided herein to identify those that possess bronchodilatory activity. In vitro and in vivo assays that may be used to evaluate bronchodilatory activity are well known to those of skill in the art. See also, e.g., U.S. Pat. Nos. 3,994,974, and 6,068,833; German Patent No. 2,305,092; Kaumann et al. (1985) Naunyn-Schmied Arch. Pharmacol. 331:27-39; Lemoine et al. (1985) Naunyn-Schmied Arch. Pharmacol. 331:40-51; Tomioka et al. (1981) Arch. Int. Pharmacodyn. 250:279-292; Dellamary et al. (2000) Pharm. Res. 17(2):168-174; Rico-Mendez et al. (1999) Rev. Alerg. Mex. 46(5):130-135; Seberova et al. (2000) Respir. Med. 94(6):607-611; Lotvall et al. (1999) Can. Respir. J. 6(5):412-416; Campbell et al. (1999) Respir. Med. 93(4):236-244; Nightingale et al. (1999) Am. J. Respir. Crit. Care Med. 159(6):1786-1790; Lecaillon et al. (1999) Eur. J. Clin. Pharmacol. 55(2):131-138; Bartow et al. (1998) Drugs 55(2):303-322; Ekstrom et al. (1998) Respir. Med. 92(8):1040-1045; Ringdal et al. (1998) Respir. Med. 92(8):1017-1021; Totterman et al. (1998) Eur. Respir. J. 12(3):573-579; Palmqvist et al. (1997) Eur. Respir. J. 10(11):2484-2489; Nielsen et al. (1997) Eur. Respir. J. 10(9):2105-2109; Ullman et al. (1996) Allergy 51(10):745-748; Selroos et al. (1996) Clin. Immunother. 6:273-299; and Schreurs et al. (1996) Eur. Respir. J. 9(8):1678-1683. The compositions provided herein are used for treating, preventing, or ameliorating one or more symptoms of a bronchoconstrictive disorders in a subject. In one embodiment, the method includes administering to a subject an effective amount of a composition containing a bronchodilating agent, including, but not limited to, formoterol, whereby the disease or disorder is treated or prevented. The subject treated is, in certain embodiments, a mammal. The mammal treated is, in certain embodiments, a human. In another embodiment, the method provided herein includes oral administration of a composition provided herein. In certain embodiments herein, the composition is directly administered to a subject in need of such treatment via nebulization without dilution or other modification of the composition prior to administration. The methods for treatment, prevention, or amelioration of one or more symptoms of bronchoconstrictive disorders, in another embodiment, further include administering one or more of (a), (b), (c) or (d) as follows: (a) a β2-adrenoreceptor agonist; (b) a dopamine (D2) receptor agonist; (c) a prophylactic therapeutic, such as a steroid; or (d) an anticholinergic agent; simultaneously with, prior to or subsequent to the composition provided herein. β2-Adrenoreceptor agonists for use in combination with the compositions provided herein include, but are not limited to, Albuterol (α1-(((1,1-dimethylethyl)amino)methyl)-4-hydroxy-1,3-benzenedimethanol); Bambuterol (dimethylcarbamic acid 5-(2-((1,1-dimethylethyl)amino)-1-hydroxyethyl)-1,3-phenylene ester); Bitolterol (4-methylbenzoic acid 4-(2-((1,1-dimethylethyl)amino)-1-hydroxyethyl)-1,2-phenylene ester); Broxaterol (3-bromo-α-(((1,1-dimethylethyl)amino)methyl)-5-isoxazolemethanol); Isoproterenol (4-(1-hydroxy-2-((1-methylethyl)amino)ethyl)-1,2-benzenediol); Trimetoquinol (1, 2,3,4-tetrahydro-1-((3,4,5-trimethoxyphenyl)-methyl)-6,7-isoquinolinediol); Clenbuterol (4-amino-3,5-dichloro-α-(((1,1-diemthylethyl)amino)methyl)benzenemethanol); Fenoterol (5-(1-hydroxy-2-((2-(4-hydroxyphenyl)-1-methylethyl)amino)ethyl)-1,3-benzenediol); Formoterol (2-hydroxy-5-((1RS)-1-hydroxy-2-(((1RS)-2-(p-methoxyphenyl)-1-methylethyl)amino)ethyl)formanilide); (R,R)-Formoterol; Desformoterol ((R,R) or (S,S)-3-amino-4-hydroxy-α-(((2-(4-methoxyphenyl)-1-methyl-ethyl)amino)methyl)benzenemethanol); Hexoprenaline (4,4′-(1,6-hexanediyl)-bis(imino(1-hydroxy-2,1-ethanediyl)))bis-1,2-benzenediol); Isoetharine (4-(1-hydroxy-2-((1-methylethyl)amino)butyl)-1,2-benzenediol); Isoprenaline (4-(1-hydroxy-2-((1-methylethyl)amino)ethyl)-1,2-benzenediol); Metaproterenol (5-(1-hydroxy-2-((-methylethyl)amino)ethyl)-1,3-benzenediol); Picumeterol (4-amino-3,5-dichloro-α-(((6-(2-(2-pyridinyl)ethoxy)hexyl)-amino)methyl)benzenemethanol); Pirbuterol (α6-(((1,1-dimethylethyl)-amino)methyl)-3-hydroxy-2,6-pyridinemethanol); Procaterol (((R*,S*)-(±)-8-hydroxy-5-(1-hydroxy-2-((1-methylethyl)amino)butyl)-2(1H)-quinolinone); Reproterol ((7-(3-((2-(3,5-dihydroxyphenyl)-2-hydroxyethyl)amino)-propyl)-3,7-dihydro-1,3-dimethyl-1H-purine-2,6-dione); Rimiterol (4-(hydroxy-2-piperidinylmethyl)-1,2-benzenediol); Salbutamol ((±)-α1-(((1,1-dimethylethyl)amino)methyl)-4-hydroxy-1,3-benzenedimethanol); (R)-Salbutamol; Salmeterol ((±)-4-hydroxy-α1-(((6-(4-phenylbutoxy)hexyl)-amino)methyl)-1,3-benzenedimethanol); (R)-Salmeterol; Terbutaline (5-(2-((1,1-dimethylethyl)amino)-1-hydroxyethyl)-1,3-benzenediol); Tulobuterol (2-chloro-α-(((1,1-dimethylethyl)amino)methyl)benzenemethanol); and TA-2005 (8-hydroxy-5-((1R)-1-hydroxy-2-(N-((1R)-2-(4-methoxyphenyl)-1-methylethyl)amino)ethyl)carbostyril hydrochloride). 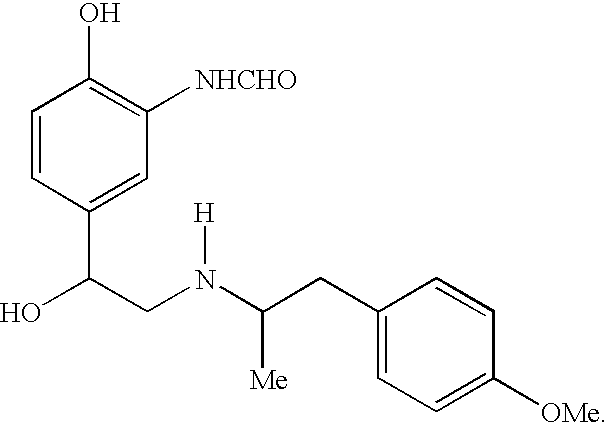 Dopamine (D2) receptor agonists include, but are not limited to, Apomorphine ((r)-5,6,6a,7-tetrahydro-6-methyl-4H-dibenzo[de,g]quinoline-10,11-diol); Bromocriptine ((5′α)-2-bromo-12′-hydroxy-2′-(1-methylethyl)-5′-(2-methylpropyl)ergotaman-3′,6′,18-trione); Cabergoline ((8β)-N-(3-(dimethylamino)propyl)-N-((ethylamino)carbonyl)-6-(2-propenyl)ergoline-8-carboxamide); Lisuride (N′-((8α)-9,10-didehydro-6-methylergolin-8-yl)-N,N-diethylurea); Pergolide ((8β)-8-((methylthio)methyl)-6-propylergoline); Levodopa (3-hydroxy-L-tryrosine); Pramipexole ((s)-4,5,6,7-tetrahydro-N6-propyl-2,6-benzothiazolediamine); Quinpirole hydrochirodie (trans-(−)-4aR-4,4a,5,6,7,8,8a,9-octahydro-5-propyl-1H-pyrazolo[3,4-g]quinoline hydrochloride); Ropinirole (4-(2-(dipropylamino)ethyl)-1,3-dihydro-2H-indol-2-one); and Talipexole (5,6,7,8-tetrahydro-6-(2-propenyl)-4H-thiazolo[4,5-d]azepin-2-amine). Other dopamine D2 receptor agonists for use herein are disclosed in International Patent Application Publication No. WO 99/36095. fluticasone or fluticasone propionate and budesonide or by way of sodium cromoglycate or nedocromil sodium. Anticholinergic agents for use herein include, but are not limited to, ipratropium bromide, oxitropium bromide, atropine methyl nitrate, atropine sulfate, ipratropium, belladonna extract, scopolamine, scopolamine methobromide, homatropine methobromide, hyoscyamine, isopriopramide, orphenadrine, benzalkonium chloride, tiotropium bromide and glycopyrronium bromide. In certain embodiments, the compositions contain an anticholinergic agent, such as ipratropium bromide or tiotropium bromide, at a concentration of about 5 μg/mL to about 5 mg/mL, or about 50 μg/mL to about 200 μg/mL. In other embodiments, the compositions for use in the methods herein contain an anticholinergic agent, including ipratropium bromide and tiotropium bromide, at a concentration of about 83 μg/mL or about 167 μg/mL. Other active ingredients for use herein in combination therapy, include, but are not limited to, IL-5 inhibitors such as those disclosed in U.S. Pat. Nos. 5,668,110, 5,683,983, 5,677,280 and 5,654,276; antisense modulators of IL-5 such as those disclosed in U.S. Pat. No. 6,136,603; milrinone (1,6-dihydro-2-methyl-6-oxo-[3,4′-bipyridine]-5-carbonitrile); milrinone lactate; tryptase inhibitors such as those disclosed in U.S. Pat. No. 5,525,623; tachykinin receptor antagonists such as those disclosed in U.S. Pat. Nos. 5,691,336, 5,877,191, 5,929,094, 5,750,549 and 5,780,467; leukotriene receptor antagonists such as montelukast sodium (Singular®, R-(E)]-1-[[[-1-[3-[2-(7-chloro-2-quinolinyl)ethenyl]phenyl]-3-[2-(1-hydroxy-1-methylethyl)phenyl]-propyl]thiolmethyl]cyclopropaneacetic acid, monosodium salt), 5-lypoxygenase inhibitors such as zileuton (Zyflo®, Abbott Laboratories, Abbott Park, Ill.), and anti-IgE antibodies such as Xolair® (recombinant humanized anti-IgE monoclonal antibody (CGP 51901; IGE 025A; rhuMAb-E25), Genentech, Inc., South San Francisco, Calif.). The bronchoconstrictive disorder to be treated, prevented, or whose one or more symptoms are to be ameliorated is associated with asthma, including, but not limited to, bronchial asthma, allergic asthma and intrinsic asthma, e.g., late asthma and airway hyper-responsiveness; and, particularly in embodiments where an anticholinergic agent is used, other chronic obstructive pulmonary diseases (COPDs), including, but not limited to, chronic bronchitis, emphysema, and associated cor pulmonale (heart disease secondary to disease of the lungs and respiratory system) with pulmonary hypertension, right ventricular hypertrophy and right heart failure. COPD is frequently associated with cigarette smoking, infections, environmental pollution and occupational dust exposure. The compositions provided herein are intended for administration to a subject in need of such treatment via nebulization. Nebulizers that nebulize liquid formulations containing no propellant are suitable for use with the compositions provided herein. Nebulizers are available from, e.g., Pari GmbH (Starnberg, Germany), DeVilbiss Healthcare (Heston, Middlesex, UK), Healthdyne, Vital Signs, Baxter, Allied Health Care, Invacare, Hudson, Omron, Bremed, AirSep, Luminscope, Medisana, Siemens, Aerogen, Mountain Medical, Aerosol Medical Ltd. (Colchester, Essex, UK), AFP Medical (Rugby, Warwickshire, UK), Bard Ltd. (Sunderland, UK), Carri-Med Ltd. (Dorking, UK), Plaem Nuiva (Brescia, Italy), Henleys Medical Supplies (London, UK), Intersurgical (Berkshire, UK), Lifecare Hospital Supplies (Leies, UK), Medic-Aid Ltd. (West Sussex, UK), Medix Ltd. (Essex, UK), Sinclair Medical Ltd. (Surrey, UK), and many others. Nebulizers for use herein include, but are not limited to, jet nebulizers (optionally sold with compressors), ultrasonic nebulizers, and others. Exemplary jet nebulizers for use herein include Pari LC plus/ProNeb, Pari LC plus/ProNeb Turbo, Pari LC plus/Dura Neb 1000 & 2000, Pari LC plus/Walkhaler, Pari LC plus/Pari Master, Pari LC star, Omron CompAir XL Portable Nebulizer System (NE-C18 and JetAir Disposable nebulizer), Omron CompAir Elite Compressor Nebulizer System (NE-C21 and Elite Air Reusable Nebilizer), Pari LC Plus or Pari LC Star nebulizer with Proneb Ultra compressor, Pulmo-aide, Pulmo-aide LT, Pulmo-aide traveler, Invacare Passport, Inspiration Healthdyne 626, Pulmo-Neb Traverler, DeVilbiss 646, Whisper Jet, Acorn II, Misty-Neb, Allied aerosol, Schuco Home Care, Lexan Plasic Pocet Neb, SideStream Hand Held Neb, Mobil Mist, Up-Draft, Up-Draft II, T Up-Draft, ISO-NEB, AVA-NEB, Micro Mist, and PulmoMate. Exemplary ultrasonic nebulizers for use herein include MicroAir, UltraAir, Siemens Ultra Nebulizer 145, CompAir, Pulmosonic, Scout, 5003 Ultrasonic Neb, 5110 Ultrasonic Neb, 5004 Desk Ultrasonic Nebulizer, Mystique Ultrasonic, Luminscope's Ultrasonic Nebulizer, Medisana Ultrasonic Nebulizer, Microstat Ultrasonic Nebulizer, and MABISMist Hand Held Ultrasonic Nebulizer. Other nebulizers for use herein include 5000 Electromagnetic Neb, 5001 Electromagnetic Neb 5002 Rotary Piston Neb, Lumineb I Piston Nebulizer 5500, Aeroneb™ Portable Nebulizer System, Aerodose™ Inhaler, and AeroEclipse Breath Actuated Nebulizer. The compositions provided herein may be packaged as articles of manufacture containing packaging material, a composition provided herein, which is useful for treatment, prevention or amelioration of one or more symptoms of diseases or disorders associated with undesired and/or uncontrolled bronchoconstriction, and a label that indicates that the composition is used for treatment, prevention or amelioration of one or more symptoms of diseases or disorders associated with undesired and/or uncontrolled bronchoconstriction. The articles of manufacture provided herein contain packaging materials. Packaging materials for use in packaging pharmaceutical products are well known to those of skill in art. See, e.g., U.S. Pat. Nos. 5,323,907, 5,052,558 and 5,033,252. Examples of pharmaceutical packaging materials include, but are not limited to, blister packs, bottles, tubes, inhalers, pumps, bags, vials, containers, syringes, bottles, and any packaging material suitable for a selected formalation and intended mode of adminastration and treatment. In one embodiment herein, the compositions are packaged with a nebulizer for direct administration of the composition to a subject in need thereof. The following examples are included for illustrative purpose only and are not intended to limit the scope of the invention. To a 5 L stainless steel vessel were added 0.68 g citric acid USP, 1.99 g sodium citrate USP, and 17.5 g sodium chloride USP. Purified water USP (2 L) was added to the stainless steel vessel and the contents were mixed with an overhead stirrer at a speed of 240 rpm for 10 minutes. Formoterol fumarate dihydrate (0.17 g for low dosage strength formulation, 0.34 g for high dosage strength formulation) was added and the solution was stirred at 240 rpm for 90 minutes. Following the procedure of EXAMPLE 1, the following formoterol unit dose formulations were prepared. A low strength formoterol unit dose formulation was prepared using the following reagents in the amounts indicated: formoterol fumarate dihydrate (0.170 mg), citric acid monohydrate, USP (0.68 mg), sodium citrate dihydrate, USP (1.99 mg), sodium chloride, USP (17.5 mg), and purified water, USP (qs to 2 mL). A high strength formoterol unit dose formulation was prepared using the following reagents in the amounts indicated: formoterol fumarate dihydrate (0.340 mg), citric acid monohydrate, USP (0.68 mg), sodium citrate dihydrate, USP (1.99 mg), sodium chloride, USP (17.5 mg), and purified water, USP (qs to 2 mL). Stability samples of the solutions prepared in EXAMPLES 1 and 2 were placed in scintillation vials with teflon-lined caps and stored in stability ovens at accelerated temperatures. At selected time points, aliquots of the samples were removed from the scintillation vials. The formoterol concentrations of the samples were analyzed by high performance liquid chromatography. 2. The kit of claim 1, wherein the composition has an estimated shelf-life of greater than 1 month usage time at 25° C. and greater than or equal to 1 year storage time at 5° C.
3. The kit of claim 2, wherein greater than about 80% of the initial formoterol is present after 1 month usage time at 25° C. and 1 year storage time at 5° C.
4. The kit of claim 1, wherein the composition further comprises a polar solvent. 5. The kit of the claim 4, wherein the polar solvent is a protic solvent. 6. The kit of the claim 5, wherein the composition further comprises a tonicity adjusting agent. 7. The kit of claim 6, wherein the tonicity adjusting agent is ammonium carbonate, ammonium chloride, ammonium lactate, ammonium nitrate, ammonium phosphate, ammonium sulfate, ascorbic acid, bismuth sodium tartrate, boric acid, calcium chloride, calcium disodium edetate, calcium gluconate, calcium lactate, citric acid, dextrose, diethanolamine, dimethylsulfoxide, edetate disodium, edetate trisodium monohydrate, fluorescein sodium, fructose, galactose, glycerin, lactic acid, lactose, magnesium chloride, magnesium sulfate, mannitol, polyethylene glycol, potassium acetate, potassium chlorate, potassium chloride, potassium iodide, potassium nitrate, potassium phosphate, potassium sulfate, propylene glycol, silver nitrate, sodium acetate, sodium bicarbonate, sodium biphosphate, sodium bisulfite, sodium borate, sodium bromide, sodium cacodylate, sodium carbonate, sodium chloride, sodium citrate, sodium iodide, sodium lactate, sodium metabisulfite, sodium nitrate, sodium nitrite, sodium phosphate, sodium propionate, sodium succinate, sodium sulfate, sodium sulfite, sodium tartrate, sodium thiosulfate, sorbitol, sucrose, tartaric acid, triethanolamine, urea, urethan, uridine or zinc sulfate. 8. The kit of claim 7, wherein the tonicity adjusting agent is sodium chloride. 9. The kit of claim 1, wherein the composition further comprises a buffer. 10. The kit of claim 9, wherein the buffer is citric acid/phosphate, acetate, barbital, borate, Britton-Robinson, cacodylate, citrate, collidine, formate, maleate, McIlvaine, phosphate, Prideaux-Ward, succinate, citrate-phosphate-borate (Teorelle-Stanhagen), veronal acetate, MES (2-(N-morpholino)ethanesulfonic acid), BIS-TRIS (bis(2-hydroxyethyl)iminotris(hydroxymethyl)methane), ADA (N-(2-acetamido)-2-iminodiacetic acid), ACES (N-(carbamoylmethyl)-2-aminoethanesulfonic acid), PIPES (piperazine-N,N′-bis(2-ethanesulfonic acid)), MOPSO (3-(N-morpholino)-2-hydroxypropanesulfonic acid), BIS-TRIS PROPANE (1,3-bis(tris(hydroxymethyl)-methylamino)propane), BES (N,N-bis(2-hydroxyethyl)-2-aminoethanesulfonic acid), MOPS (3-(N-morpholino)propanesulfonic acid), TES (N-tris(hydroxymethyl)methyl-2-aminoethanesulfonic acid), HEPES (N-(2-hydroxyethyl)piperazine-N′-(2-ethanesulfonic acid), DIPSO (3-(N,N-bis(2-hydroxyethyl)amino)-2-hydroxypropanesulfonic acid), MOBS (4-(N-morpholino)butanesulfonic acid), TAPSO (3-(N-tris(hydroxymethyl)methylamino)-2-hydroxypropanesulfonic acid), tris(hydroxymethylaminomethane, HEPPSO (N-(2-hydroxyethyl)piperazine-N′-(2-hydroxypropanesulfonic acid), POPSO (piperazine-N,N′-bis(2-hydroxypropane-sulfonic acid)), TEA (triethanolamine), EPPS (N-(2-hydroxyethyl)piperazine-N′-(3-propanesulfonic acid), TRICINE (N-tris(hydroxymethyl)methylglycine), GLY-GLY (glycylglycine), BICINE (N,N-bis(2-hydroxyethyl)glycine), HEPBS (N-(2-hydroxyethyl)piperazine-N′-(4-butanesulfonic acid)), TAPS (N-tris(hydroxy-methyl)methyl-3-aminopropanesulfonic acid), or AMPD (2-amino-2-methyl-1,3-propanediol) buffer. 11. The kit of claim 10, wherein the buffer is citrate buffer. 12. The kit of claim 11, wherein the buffer concentration is from about 0.01 mM to about 150 mM. 13. The kit of claim 12, wherein the buffer concentration is from about 1 mM to about 20 mM. 14. The kit of claim 13, wherein the buffer concentration is about 5 mM. 15. The kit of claim 7, wherein the ionic strength of the composition is about 0 to about 0.4. 16. The kit of claim 15, wherein the ionic strength of the composition is about 0.05 to about 0.16. 17. The kit of claim 1, wherein the pH of the composition is about 2.0 to about 8.0. 18. The kit of claim 17, wherein the pH of the composition is about 4.0 to about 6.0. 19. The kit of claim 18, wherein the pH of the composition is about 4.5 to about 5.5. 20. The kit of claim 19, wherein the pH of the composition is about 5.0. 21. The kit of claim 1, wherein the formoterol free base concentration in the composition is about 5 μg/mL to about 2 mg/mL. 22. The kit of claim 21, wherein the formoterol free base concentration in the composition is about 10 μg/mL to about 1 mg/mL. 23. The kit of claim 22, wherein the formoterol free base concentration in the composition is about 50 μg/mL to about 200 μg/mL. 24. The kit of claim 23, wherein the formoterol free base concentration in the composition is about 59 μg/mL. 25. The kit of claim 23, wherein the formoterol free base concentration in the composition is about 118 μg/mL. 26. The kit of claim 7, wherein the composition further comprises a buffer. 27. The kit of claim 26, wherein the buffer is citric acid/phosphate, acetate, barbital, borate, Britton-Robinson, cacodylate, citrate, collidine, formate, maleate, McIlvaine, phosphate, Prideaux-Ward, succinate, citrate-phosphate-borate (Teorell-Stanhagen), veronal acetate, MES (2-(N-morpholino)ethanesulfonic acid), BIS-TRIS (bis(2-hydroxyethyl)iminotris(hydroxymethyl)methane), ADA (N-(2-acetamido)-2-iminodiacetic acid), ACES (N-(carbamoylmethyl)-2-aminoethanesulfonic acid), PIPES (piperazine-N,N′-bis(2-ethanesulfonic acid)), MOPSO (3-(N-morpholino)-2-hydroxypropanesulfonic acid), BIS-TRIS PROPANE (1,3-bis(tris(hydroxymethyl)methylamino)propane), BES (N,N-bis(2-hydroxyethyl)-2-aminoethanesulfonic acid), MOPS (3-(N-morpholino)propanesulfonic acid), TES (N-tris(hydroxymethyl)methyl-2-aminoethanesulfonic acid), HEPES (N-(2-hydroxyethyl)piperazine-N′-(2-ethanesulfonic acid), DIPSO (3-(N,N-bis(2-hydroxyethyl)amino)-2-hydroxypropanesulfonic acid), MOBS ((N-morpholino)-butanesulfonic acid), TAPSO (3-(N-tris(hydroxymethyl)methylamino)-2-hydroxy-propanesulfonic acid), tris(hydroxymethylaminomethane, HEPPSO (N-(2-hydroxyethyl)piperazine-N′-(2-hydroxypropanesulfonic acid), POPSO (piperazine-N,N′-bis(2-hydroxypropanesulfonic acid)), TEA (triethanolamine), EPPS (N-(2-hydroxyethyl)piperazine-N′-(3-propanesulfonic acid), TRICINE (N-tris(hydroxy-methyl)methylglycine), GLY-GLY (glycylglycine), BICINE (N,N-bis(2-hydroxyethyl)glycine), HEPBS (N-(2-hydroxyethyl)piperazine-N′-(4-butanesulfonic acid)), TAPS (N-tris(hydroxymethyl)methyl-3-aminopropanesulfonic acid), or AMPD (2-amino-2-methyl-1,3-propanediol) buffer. 28. The kit of claim 27, wherein the buffer is citrate buffer. 29. The kit of claim 28, wherein the buffer concentration is from about 0.01 mM to about 150 mM. 30. The kit of claim 29, wherein the buffer concentration is from about 1 mM to about 20 mM. 31. The kit of claim 30, wherein the buffer concentration is about 5 mM. 32. The kit of claim 26, wherein the ionic strength of the composition is about 0 to about 0.4. 33. The kit of claim 32, wherein the ionic strength of the composition is about 0.05 to about 0.16. 34. The kit of claim 26, wherein the pH of the composition is about 2.0 to about 8.0. 35. The kit of claim 34, wherein the pH of the composition is about 4.0 to about 6.0. 36. The kit of claim 35, wherein the pH of the composition is about 4.5 to about 5.5. 37. The kit of claim 36, wherein the pH of the composition is about 5.0. 38. The kit of claim 26, wherein the formoterol free base concentration in the composition is about 5 μg/mL to about 2 mg/mL. 39. The kit of claim 28, wherein the formoterol free base concentration in the composition is about 10 μg/mL to about 1 mg/mL. 40. The kit of claim 39, wherein the formoterol free base concentration in the composition is about 50 μg/mL to about 200 μg/mL. 41. The kit of claim 40, wherein the formoterol free base concentration in the composition is about 59 μg/mL. 42. The kit of claim 40, wherein the formoterol free base concentration in the composition is about 118 μg/mL. 43. The kit of claim 1, wherein the composition comprises (a) formoterol free base at a concentration of about 59 μg/mL; (b) aqueous saline comprising sodium chloride; and (c) citrate buffer at a concentration of about 5 mM; wherein the ionic strength of the composition is about 0.05 to about 0.16; and the pH of the composition is about 5.0. 44. The kit of claim 1, wherein the composition comprises (a) formoterol free base at a concentration of about 118 μg/mL; (b) aqueous saline comprising sodium chloride; and (c) citrate buffer at a concentration of about 5 mM; wherein the ionic strength of the composition is about 0.05 to about 0.16; and the pH of the composition is about 5.0. 45. The kit of claim 1, wherein the composition comprises (a) formoterol free base at a concentration of about 59 μg/mL; (b) aqueous saline comprising sodium chloride; and (c) citrate buffer at a concentration of about 2 mM; wherein the ionic strength of the composition is about 0.05 to about 0.16; and the pH of the composition is about 5.0. 46. The kit of claim 1, wherein the composition comprises (a) formoterol free base at a concentration of about 118 μg/mL; (b) aqueous saline comprising sodium chloride; and (c) citrate buffer at a concentration of about 2 mM; wherein the ionic strength of the composition is about 0.05 to about 0.16; and the pH of the composition is about 5.0. 47. The kit of claim 41, wherein the buffer is citrate buffer. 48. The kit of claim 41, wherein the buffer concentration is about 5 mM. 49. The kit of claim 41, wherein the ionic strength of the composition is about 0.005 to about 0.16. 50. The kit of claim 41, wherein the pH of the composition is about 5.0. 51. The kit of claim 41, wherein the buffer is citrate buffer; the buffer concentration is about 5 mM; the ionic strength of the composition is about 0.005 to about 0.16; and the pH of the composition is about 5.0. 52. The kit of claim 42, wherein the buffer is citrate buffer. 53. The kit of claim 42, wherein the buffer concentration is about 5 mM. 54. The kit of claim 42, wherein the ionic strength of the composition is about 0.05 to about 0.16. 55. The kit of claim 42, wherein the pH of the composition is about 5.0. 56. The kit of claim 42, wherein the buffer is citrate buffer; the buffer concentration is about 5 mM; the ionic strength of the composition is about 0.05 to about 0.16; and the pH of the composition is about 5.0. 57. The kit of claim 1, further comprising one or more of (a) to (j) as follows: (a) a β2-adrenoreceptor agonist; (b) a dopamine (D2) receptor agonist; (c) an IL-5 inhibitor; (d) an antisense modulator of IL-5; (e) a tryptase inhibitor; (f) a tachykinin receptor antagonist; (g) milrinone or milrinone lactate; (h) a leukotriene receptor antagonist; (i) a 5-lypoxygenase inhibitor; or (j) an anti-IgE antibody. 58. The kit of claim 10, wherein the buffer comprises citric acid/phosphate buffer, acetate buffer, citrate buffer or phosphate buffer. 59. The kit of claim 26, wherein the buffer comprises citric acid/phosphate buffer, acetate buffer, citrate buffer or phosphate buffer. 60. The kit of claim 12, wherein the buffer concentration is from about 1 mM to about 50 mM. 61. The kit of claim 60, wherein the buffer concentration is about 20 mM. 62. The kit of claim 29, wherein the buffer concentration is from about 1 mM to about 50 mM. 63. The kit of claim 62, wherein the buffer concentration is about 20 mM. 64. The kit of claim 41, wherein the buffer concentration is about 20 mM. 65. The kit of claim 41, wherein the buffer is citrate buffer; the buffer concentration is about 20 mM; the ionic strength of the composition is about 0.01 to about 0.16; and the pH of the composition is about 5.0. 66. The kit of claim 42, wherein the buffer concentration is about 20 mM. 67. The kit of claim 42, wherein the buffer is citrate buffer; the buffer concentration is about 20 mM; the ionic strength of the composition is about 0.01 to about 0.16; and the pH of the composition is about 5.0. 68. The kit of claim 1, further comprising an anticholinergic agent. 69. The kit of claim 68, wherein the anticholinergic agent is ipratropium bromide, oxitropium bromide, atropine methyl nitrate, tiotropium bromide or glycopyrronium bromide. 70. The kit of claim 69, wherein the anticholinergic agent is ipratropium bromide. 71. The kit of claim 70, wherein the ipratropium bromide is present at a concentration of about 5 μg/mL to about 5 mg/mL. 72. The kit of claim 69, wherein the anticholinergic agent is tiotropium bromide. 73. The kit of claim 72, wherein the tiotropium bromide is present at a concentration of about 5 μg/mL to about 5 mg/mL. 74. A method for the treatment, prevention, or amelioration of one or more symptoms of bronchoconstrictive disorders, comprising administering an effective amount of a pharmaceutical composition to a subject in need of such treatment, wherein the pharmaceutical composition comprises formoterol or a derivative thereof formulated at a concentration suitable for direct administration to a subject in need thereof, in a pharmacologically suitable fluid, wherein the composition is stable during long term storage and the fluid comprises water. 75. The method of claim 74, wherein the composition has an estimated shelf-life of greater than 1 month usage time at 25° C. and greater than or equal to 1 year storage time at 5° C.
76. The method of claim 75, wherein greater than about 80% of the initial formoterol is present after 1 month usage time at 25° C. and 1 year storage time at 5° C.
77. The method of claim 74, wherein the composition further comprises a polar solvent. 78. The method of claim 77, wherein the polar solvent is a protic solvent. 79. The method of claim 78, wherein the composition further comprises a tonicity adjusting agent. 80. The method of claim 79, wherein the tonicity adjusting agent is ammonium carbonate, ammonium chloride, ammonium lactate, ammonium nitrate, ammonium phosphate, ammonium sulfate, ascorbic acid, bismuth sodium tartrate, boric acid, calcium chloride, calcium disodium edetate, calcium gluconate, calcium lactate, citric acid, dextrose, diethanolamine, dimethylsulfoxide, edetate disodium edetate trisodium monohydrate, fluorescein sodium, fructose, galactose, glycerin lactic acid, lactose, magnesium chloride, magnesium sulfate, mannitol, polyethylene glycol, potassium acetate, potassium chlorate, potassium chloride, potassium iodide, potassium nitrate, potassium phosphate, potassium sulfate, propylene glycol, silver nitrate, sodium acetate, sodium bicarbonate, sodium biphosphate, sodium bisulfite, sodium borate, sodium bromide, sodium cacodylate, sodium carbonate, sodium chloride, sodium citrate, sodium iodide, sodium lactate, sodium metabisulfite, sodium nitrate, sodium nitrite, sodium phosphate, sodium propionate, sodium succinate, sodium sulfate, sodium sulfite, sodium tartrate, sodium thiosulfate, sorbitol, sucrose, tartaric acid, triethanolamine, urea, urethan, uridine or zinc sulfate. 81. The method of claim 80, wherein the tonicity adjusting agent is sodium chloride. 82. The method of claim 74, wherein the composition further comprises a buffer. 83. The method of claim 82, wherein the buffer is citric acid/phosphate, acetate, barbital, borate, Britton-Robinson, cacodylate, citrate, collidine, formate, maleate, McIlvaine, phosphate, Prideaux-Ward, succinate, citrate-phosphate-borate (Teorell-Stanhagen), veronal acetate, MES (2-(N-morpholino)ethanesulfonic acid), BIS-TRIS (bis(2-hydroxyethyl)iminotris(hydroxymethyl)methane), ADA (N-(2-acetamido)-2-iminodiacetic acid), ACES (N-(carbamoylmethyl)-2-aminoethanesulfonic acid), PIPES (piperazine-N,N′-bis(2-ethanesulfonic acid)), MOPSO (3-(N-morpholino)-2-hydroxypropanesulfonic acid), BIS-TRIS PROPANE (1,3-bis(tris(hydroxymethyl)methylamino)propane), BES (N,N-bis(2-hydroxyethyl)-2-aminoethanesulfonic acid), MOPS (3-(N-morpholino)propanesulfonic acid), TES (N-tris(hydroxymethyl)methyl-2-aminoethanesulfonic acid), HEPES (N-(2-hydroxyethyl)piperazine-N′-(2-ethanesulfonic acid), DIPSO (3-(N,N-bis(2-hydroxyethyl)amino)-2-hydroxypropanesulfonic acid), MOBS (4-(N-morpholino)-butanesulfonic acid), TAPSO (3-(N-tris(hydroxymethyl)methylamino)-2-hydroxy-propanesulfonic acid), tris(hydroxymethylaminomethane, HEPPSO (N-(2-hydroxyethyl)piperazine-N′-(2-hydroxypropanesulfonic acid), POPSO (piperazine-N,N′-bis(2-hydroxypropanesulfonic acid)), TEA (triethanolamine), EPPS (N-(2-hydroxyethyl)piperazine-N′-(3-propanesulfonic acid), TRICINE (N-tris(hydroxy-methyl)methylglycine), GLY-GLY (glycylglycine), BICINE (N,N-bis(2-hydroxyethyl)glycine), HEPBS (N-(2-hydroxyethyl)piperazine-N′-(4-butanesulfonic acid)), TAPS (N-tris(hydroxymethyl)methyl-3-aminopropanesulfonic acid), or AMPD (2-amino-2-methyl-1,3-propanediol) buffer. 84. The method of claim 83, wherein the buffer is citrate buffer. 85. The method of claim 84, wherein the buffer concentration is from about 0.01 mM to about 150 mM. 86. The method of claim 85, wherein the buffer concentration is from about 1 mM to about 20 mM. 87. The method of claim 86, wherein the buffer concentration is about 5 mM. 88. The method of claim 87, wherein the ionic strength of the composition is about 0 to about 0.4. 89. The method of claim 88, wherein the ionic strength of the composition is about 0.05 to about 0.16. 90. The method of claim 74, wherein the pH of the composition is about 2.0 to about 8.0. 91. The method of claim 90, wherein the pH of the composition is about 4.0 to about 6.0. 92. The method of claim 91, wherein the pH of the composition is about 4.5 to about 5.5. 93. The method of claim 92, wherein the pH of the composition is about 5.0. 94. The method of claim 74, wherein the formoterol free base concentration in the composition is about 5 μg/mL to about 2 mg/mL. 95. The method of claim 94, wherein the formoterol free base concentration in the composition is about 10 μg/mL to about 1 mg/mL. 96. The method of claim 95, wherein the formoterol free base concentration in the composition is about 50 μg/mL to about 200 μg/mL. 97. The method of claim 96, wherein the formoterol free base concentration in the composition is about 59 μg/mL. 98. The method of claim 96, wherein the formoterol free base concentration in the composition is about 118 μg/mL. 99. The method of claim 80, wherein the composition further comprises a buffer. 100. The method of claim 99, wherein the buffer is citric acid/phosphate, acetate, barbital, borate, Britton-Robinson, cacodylate, citrate, collidine, formate, maleate, McIlvaine, phosphate, Prideaux-Ward, succinate, citrate-phosphate-borate (Teorell-Stanhagen), veronal acetate, MES (2-(N-morpholino)ethanesulfonic acid), BIS-TRIS (bis(2-hydroxyethyl)iminotris(hydroxymethyl)methane), ADA (N-(2-acetamido)-2-iminodiacetic acid), ACES (N-(carbamoylmethyl)-2-aminoethanesulfonic acid), PIPES (piperazine-N,N′-bis(2-ethanesulfonic acid)), MOPSO (3-(N-morpholino)-2-hydroxypropanesulfonic acid), BIS-TRIS PROPANE (1,3-bis(tris(hydroxymethyl)methylamino)propane), BES (N,N-bis(2-hydroxyethyl)-2-aminoethanesulfonic acid), MOPS (3-(N-morpholino)propanesulfonic acid), TES (N-tris(hydroxymethyl)methyl-2-aminoethanesulfonic acid), HEPES (N-(2-hydroxyethyl)piperazine-N′-(2-ethanesulfonic acid), DIPSO (3-(N,N-bis(2-hydroxyethyl)amino)-2-hydroxypropanesulfonic acid), MOBS (4-(N-morpholino)-butanesulfonic acid), TAPSO (3-(N-tris(hydroxymethyl)methylamino)-2-hydroxy-propanesulfonic acid), tris(hydroxymethylaminomethane, HEPPSO (N-(2-hydroxyethyl)piperazine-N′-(2-hydroxypropanesulfonic acid), POPSO (piperazine-N,N′-bis(2-hydroxypropanesulfonic acid)), TEA (triethanolamine), EPPS (N-(2-hydroxyethyl)piperazine-N′-(3-propanesulfonic acid), TRICINE (N-tris(hydroxy-methyl)methylglycine), GLY-GLY (glycylglycine), BICINE (N,N-bis(2-hydroxyethyl)glycine), HEPBS (N-(2-hydroxyethyl)piperazine-N′-(4-butanesulfonic acid)), TAPS (N-tris(hydroxymethyl)methyl-3-aminopropanesulfonic acid), or AMPD (2-amino-2-methyl-1,3-propanediol) buffer. 101. The method of claim 100, wherein the buffer is citrate buffer. 102. The method of claim 101, wherein the buffer concentration is from about 0.01 mM to about 150 mM. 103. The method of claim 102, wherein the buffer concentration is from about 1 mM to about 20 mM. 104. The method of claim 103, wherein the buffer concentration is about 5 mM. 105. The method of claim 99, wherein the ionic strength of the composition is about 0 to about 0.4. 106. The method of claim 105, wherein the ionic strength of the composition is about 0.05 to about 0.16. 107. The method of claim 99, wherein the pH of the composition is about 2.0 to about 8.0. 108. The method of claim 107, wherein the pH of the composition is about 4.0 to about 6.0. 109. The method of claim 108, wherein the pH of the composition is about 4.5 to about 5.5. 110. The method of claim 109, wherein the pH of the composition is about 5.0. 111. The method of claim 99, wherein the formoterol free base concentration in the composition is about 5 μg/mL to about 2 mg/mL. 112. The method of claim 111, wherein the formoterol free base concentration in the composition is about 10 μg/mL to about 1 mg/mL. 113. The method of claim 112, wherein the formoterol free base concentration in the composition is about 50 μg/mL to about 200 μg/mL. 114. The method of claim 113, wherein the formoterol free base concentration in the composition is about 59 μg/mL. 115. The method of claim 113, wherein the formoterol free base concentration in the composition is about 118 μg/mL. 116. The method of claim 74, wherein the composition comprises (a) formoterol free base at a concentration of about 59 μg/mL; (b) aqueous saline comprising sodium chloride; and (c) citrate buffer at a concentration of about 5 mM; wherein the ionic strength of the composition is about 0.05 to about 0.16; and the pH of the composition is about 5.0. 117. The method of claim 74, wherein the composition comprises (a) formoterol free base at a concentration of about 118 μg/mL; (b) aqueous saline comprising sodium chloride; and (c) citrate buffer at a concentration of about 5 mM; wherein the ionic strength of the composition is about 0.05 to about 0.16; and the pH of the composition is about 5.0. 118. The method of claim 74, wherein the composition comprises (a) formoterol free base at a concentration of about 59 μg/mL; (b) aqueous saline comprising sodium chloride; and (c) citrate buffer at a concentration of about 2 mM; wherein the ionic strength of the composition is about 0.05 to about 0.16; and the pH of the composition is about 5.0. 119. The method of claim 74, wherein the composition comprises (a) formoterol free base at a concentration of about 118 μg/mL; (b) aqueous saline comprising sodium chloride; and (c) citrate buffer at a concentration of about 2 mM; wherein the ionic strength of the composition is about 0.05 to about 0.16; and the pH of the composition is about 5.0. 120. The method of claim 113, wherein the buffer is citrate buffer. 121. The method of claim 113, wherein the buffer concentration is about 5 mM. 122. The method of claim 113, wherein the ionic strength of the composition is about 0.05 to about 0.16. 123. The method of claim 113, wherein the pH of the composition is about 5.0. 124. The method of claim 113, wherein the buffer is citrate buffer; the buffer concentration is about 5 mM; the ionic strength of the composition is about 0.05 to about 0.16; and the pH of the composition is about 5.0. 125. The method of claim 114, wherein the buffer is citrate buffer. 126. The method of claim 114, wherein the buffer concentration is about 5 mM. 127. The method of claim 114, wherein the ionic strength of the composition is about 0.05 to about 0.16. 128. The method of claim 114, wherein the pH of the composition is about 5.0. 129. The method of claim 114, wherein the buffer is citrate buffer; the buffer concentration is about 5 mM; the ionic strength of the composition is about 0.05 to about 0.16; and the pH of the composition is about 5.0. 130. The method of claim 74, further comprising administration of one or more of (a) to (j) as follows: (a) a β2-adrenoreceptor agonist; (b) a dopamine receptor agonist; (c) an IL-5 inhibitor; (d) an antisense modulator of IL-5; (e) a tryptase inhibitor; (f) a tachykinin receptor antagonist; (g) milrinone or milrinone lactate; (h) a leukotriene receptor antagonist; (i) a 5-lypoxygenase inhibitor; or (j) an anti-IgE antibody. 131. The method of claim 83, wherein the buffer comprises citric acid/phosphate buffer, acetate buffer, citrate buffer or phosphate buffer. 132. The method of claim 99, wherein the buffer comprises citric acid/phosphate buffer, acetate buffer, citrate buffer or phosphate buffer. 133. The method of claim 85, wherein the buffer concentration is from about 1 mM to about 50 mM. 134. The method of claim 133, wherein the buffer concentration is about 20 mM. 135. The method of claim 102, wherein the buffer concentration is from about 1 mM to about 50 mM. 136. The method of claim 135, wherein the buffer concentration is about 20 mM. 137. The method of claim 114, wherein the buffer concentration is about 20 mM. 138. The method of claim 114, wherein the buffer is citrate buffer; the buffer concentration is about 20 mM; the ionic strength of the composition is about 0.05 to about 0.16; and the pH of the composition is about 5.0. 139. The method of claim 115, wherein the buffer concentration is about 20 mM. 140. The method of claim 115, wherein the buffer is citrate buffer; the buffer concentration is about 20 mM; the ionic strength of the composition is about 0.05 to about 0.16; and the pH of the composition is about 5.0. 141. The method of claim 74, further comprising an anticholinergic agent. 142. The method of claim 141, wherein the anticholinergic agent is ipratropium bromide, oxitropium bromide, atropine methyl nitrate, tiotropium bromide or glycopyrronium bromide. 143. The method of claim 142, wherein the anticholinergic agent is ipratropium bromide. 144. The method of claim 143, wherein the ipratropium bromide is present at a concentration of about 5 μg/mL to about 5 mg/mL. 145. The method of claim 142, wherein the anticholinergic agent is tiotropium bromide. 146. The method of claim 145, wherein the tiotropium bromide is present at a concentration of about 5 μg/mL to about 5 mg/mL. ES2260915T3 (en) 1998-05-27 2006-11-01 Euro-Celtique S.A. Preparations for application of antiinflammatory agentets, especially antiseptic agents and / or agents that stimulate wound healing in the upper respiatorio tract and / or in the ear. "Flovent", Glaxo Wellcome Inc., Physicians' Desk Reference, 54th ed., (2000), pp. 1186-1189. Barnes, P.J., "Scientific rationale for inhaled combination therapywith long-acting beta2 -agonists and corticosteroids,"Eur. Respir. J. 19: 182-191 (2002). Barnes, P.J., "Scientific rationale for inhaled combination therapywith long-acting β2 -agonists and corticosteroids,"Eur. Respir. J. 19: 182-191 (2002). Barrow and Brogden, "An Update of its Pharmacological Properties and Therapeutic Efficacy in the Management of Astma," Drugs, 55(2):303-322 (1998). Campbell et al, "A comparison of the efficacy of long-acting B2-agonists: eformoterol via Turbohaler(R) and salmeterol via pressurized metered dose inhaler or Accuhaler (R), in mild to moderate asthmatics," Respiratory Medicine, 93:236-244 (1999). Campestrini et al., "Automated and sensitive method for the determination of formoterol in human plasma by high-performance liquid chromatography and electrochemical detection," Journal of Chromatography B 704: 221-229 (1997). Cazzola et al., "Long-Acting beta2-Agonists in the Treatment of Acute Exacerbations of COPD," Clin. Drug Invest. 22(6): 369-376 (2002). Cazzola et al., "Long-Acting β2-Agonists in the Treatment of Acute Exacerbations of COPD," Clin. Drug Invest. 22(6): 369-376 (2002). Dellamary et al, "Hollow Porous Particles in Metered Dose Inhalers,"Pharmaceutical Research, 17(2): 168-174 (2000). Derwent #010743444, WPI Acc No. : 1996-240399/199625 for German Patent Application DE 19541689, "Medicament contg. ciclesonid and beta2-sympathomimetic-for treating chromic obstructive respiratory disease". Derwent #010743444, WPI Acc No. : 1996-240399/199625 for German Patent Application DE 19541689, "Medicament contg. ciclesonid and beta2-sympathomimetic—for treating chromic obstructive respiratory disease". Derwent #012030009, WPI Acc No. : 1998-446919-199838 for PCT Patent Application WO 98/34595, "Pressurised liquid aerosol propellant for pharmaceutical inhalers-contains carbon dioxide and hydro-fluoroalkane; gives more consistent dosing and a better particle size spectrum". Derwent #012030009, WPI Acc No. : 1998-446919-199838 for PCT Patent Application WO 98/34595, "Pressurised liquid aerosol propellant for pharmaceutical inhalers—contains carbon dioxide and hydro-fluoroalkane; gives more consistent dosing and a better particle size spectrum". Derwent #013011051, WPI Acc No. : 2000-182903/200016 for PCT Patent Application WO 00/06121, "Aerosol propellant comprising dinitrogen monoxide and hydrofluoroalkane and optionally containing a pharmaceutically active substance". Derwent #013023586, WPI Acc No. 2000-195437/200017, for PCT Patent Application WO 00/07567 "Aerosol formulation for drug administration, containing small amount of cromoglycate or nedocromil salt as drug carrier, to improve dispersion stability and accuracy of dosing". Derwent #013024375, WPI Acc No. : 2000-196226/200018 for German Patent Application DE 19835346, "Two-part drug capsule for use in powder inhalers is formed from hydrophobic plastics, preferably high density polyethylene". Derwent #013227765, WPI Acc No. 2000-399639/200034, for PCT Patent Application, WO 00/28979 "Use of magnesium stearate for stabilization of dry powder inhalation formulations to improve resistance to moisture". Derwent #013790372, WPI Acc No. : 2001-274583/200129, for PCT Patent Application, WO 01/22956 "Drug combination of soft steroid and beta-2-adrenoceptor agonist, administered by inhalation for effective treatment of respiratory or allergic diseases, e.g. asthma". Derwent #014816787, WPI. Acc No. : 2002-637493/200269, for PCT Patent Application, WO 02/060532 "Medicament containing a betamimetic and an ipratropium salt useful for the treatment of respiratory disorders with reduced side effects". Derwent #01488338, WPI Acc No. : 2002-629044/200268, for PCT Patent Application, WO 02/060533 "Medicament containing a betamimetic and an oxitropium salt useful for the treatment of respiratory disorders with reduced side effects". Derwent# 000971705, WPI Acc. No. 1973-48969U/197335 citing German Patent Application No. DE 2305092 A, "Alpha-aminomethylbenzyl alcohol derivs.-prepd. by redn. of corresponding protected derivs." Eickelberg et al., "Ligand-independent Activation of the Glucocorticoid Receptors by beta2 -Adrenergic Receptor Agonists in Primary Human Lung Fibroblasts and vascular Smooth Muscle Cells," The Journal of Biological Chemistry 274(2): 1005-1010 (1999). Eickelberg et al., "Ligand-independent Activation of the Glucocorticoid Receptors by β2 -Adrenergic Receptor Agonists in Primary Human Lung Fibroblasts and vascular Smooth Muscle Cells," The Journal of Biological Chemistry 274(2): 1005-1010 (1999). Ekstrom et al, "Low-dose formoterol Turbuhaler (R) (Oxis (R) b.i.d., a 3-month placebo-controlled comparison with terbutaline (q.i.d. )," Respiratory Medicine, 92:1040-1045 (1998). Farmer et al., "beta-Adrenergic agonists exert their "anti-inflammatory" effects in monocytic cells through the 1kappaB/NF-kappaB pathway," Am. J. Physiol. Lung. Cell. Mol. Physiol. 279: I675-682 (2000). Farmer et al., "β-Adrenergic agonists exert their "anti-inflammatory" effects in monocytic cells through the 1κB/NF-κB pathway," Am. J. Physiol. Lung. Cell. Mol. Physiol. 279: I675-682 (2000). Greening et al., "Added salmeterol versus higher-dose cortiocosteroid in asthama patients with symptoms on existing inhaled corticosteroid," The Lancet 344: 219-224 (1994). Grootendorst et al., "Effect of oral prednisolone on the bronchoprotective effect of formoterol in patients with persistent asthma," Eur. Respir. J. 17: 374-379 (2001). Hardman et al. (Eds. ), Goodman Gilman's The Pharmacological Basis of Therapeutics, 1996, p. 665. Ida, Hisashi, "Pharmacology of Formoterol, (alphaRS)-3-formamido-4-hydroxy-alpha-[[[(alphaRS)-rho-methoxy-alpha-methylphenthyl] amino] methyl] benzylalcohol fumarate dihydrate (BD 40A)," Oyo Yakuri 21(2): 201-210 (1981). Ida, Hisashi, "Pharmacology of Formoterol, (αRS)-3-formamido-4-hydroxy-α-[[[(αRS)-ρ-methoxy-α-methylphenthyl] amino] methyl] benzylalcohol fumarate dihydrate (BD 40A)," Oyo Yakuri 21(2): 201-210 (1981). Ito et al., "Glucocorticoid Receptor Recruitment of Histone Deacetylase 2 Inhibits Interleukin-1beta-Induced Histone H4 Acetylation on Lysines 8 and 12," Molecular and Cellular Biology 20(18): 6892-6903 (2000). Ito et al., "Glucocorticoid Receptor Recruitment of Histone Deacetylase 2 Inhibits Interleukin-1β-Induced Histone H4 Acetylation on Lysines 8 and 12," Molecular and Cellular Biology 20(18): 6892-6903 (2000). Ito et al., "p65-activated Histone Acetyltransferase Activity Is Repressed by Glucocorticoids," The Journal of Biological Chemistry 276(32): 30208-30215 (2001). Kaumann and Lemoine, "Direct labelling of myocardial B1-adrenoceptors; Comparison of binding affinity of 3H-(--)-bisoprolol with its blocking potency," Archives of Pharmacology, 331:27-39 (1985). Kaumann and Lemoine, "Direct labelling of myocardial B1-adrenoceptors; Comparison of binding affinity of 3H-(——)-bisoprolol with its blocking potency," Archives of Pharmacology, 331:27-39 (1985). Korn et al., "Effects of formoterol and budesonide on GM-CSF and IL-8 secretion by triggered human bronchial epithelial cells," Eur. Respir. J. 17: 1070-1077 (2001). Lecaillon et al, "Pharmacokinetics and tolerability of formoterol in healthy volunteers after single high dose of Foradil dry powder Inhalation via aerolizer (TM)," European Journal Clinical Pharmacology, 55: 131-138 (1999). Leckie et al., "Novel Therapy of COPD," Expert Opin Investig Drugs 9(1):3-23 (2000). Lemoine et al, "Direct labelling of B2-adrenoceptors; Comparison of binding potency of 3H-ICI 118,551 and blocking potency of ICI 118,551," Archives of Pharmacology, 331:40-51 (1985). Lipworth et al., "Effects of Treatment with Formoterol on Bronchoprotection against Methacholine," Am. J. Med. 104: 431-438 (1998). Lotvall et al, "Similar bronchodilation with formoterol delivered by Aerolizer or Turbuhaler," Can Respir J, 6(5):412-416 (1999). Maloleszy et al., "Safety of formoterol Turbuhaler(TM) at cumulative dose of 90 mug in patients with acute bronchial obstruction," Eur. Respir. J. 18: 928-934 (2001). Maloleszy et al., "Safety of formoterol Turbuhaler™ at cumulative dose of 90 μg in patients with acute bronchial obstruction," Eur. Respir. J. 18: 928-934 (2001). Nielsen et al, "Flow-dependent effect of formoterol dry-powder inhaled from the Aerolizer (R)," Eur Repir J, 10:2105-2109 (1997). Nigthingale et al, "Differential Effect of Formoterol on Adenosine Monophosphate and Histamine Reactivity in Asthma," Am J Respir Crit Care Med, 159:1786-1790 (1999). Nogrady, T., (editor), Medicinal Chemistry: A Biochemical Approach, Oxford University Press, New York, pp. 388-392 (1985). O'Connor, B.J., "Combination Therapy," Pulmonary Pharmacology & Therapeutics 11: 397-399 (1998). Oddera et al., "Salmeterol Enhances the Inhibitory Activity of Dexamethasone on Allergen-Induced Blood Mononuclear Cell Activation," Respiration 65: 199-204 (1998). Package Insert for: ADVAIR(TM) DISKUS http://fb.a-files.net/PackageInsert/Advair.htm (acessed on Sep. 26, 2002) (Copyright, 1999 Glaxo Wellcome Inc.). Package Insert for: ADVAIR™ DISKUS http://fb.a-files.net/PackageInsert/Advair.htm (acessed on Sep. 26, 2002) (Copyright, 1999 Glaxo Wellcome Inc.). Palmqvist et al, "Inhaled dry-powder formoterol and salmeterol in asthmatic patients: onset of acation, duration of effect and potency," Eur Respir J, 10:2484-2489 (1997). Palmqvist et al., "Onset of Bronchodilation of Budesonide/Formoterol vs. Salmeterol/Fluticasone in Single Inhalers," Pulmonary Pharmacology & Therapeutics 14:29-34 (2001). Pang, L. and A.J. Knox, "Regulation of TNF-alpha-induced eotaxin release from cultured human airway smooth muscle cells by beta2-agonists and corticosteroids," FASEB J. 15: 261-269 (2001). Pang, L. and A.J. Knox, "Regulation of TNF-α-induced eotaxin release from cultured human airway smooth muscle cells by β2-agonists and corticosteroids," FASEB J. 15: 261-269 (2001). Pang, L. and A.J. Knox, "Synergistic Inhibition by beta2-Agonists and Corticosteroids on Tumor Necrosis Factor-alpha-Induced Interleukin-8 Release from Cultured Human Airway Smooth-Muscle Cells," Am. J. Respir. Cell Mol. Biol. 23: 79-85 (2000). Pang, L. and A.J. Knox, "Synergistic Inhibition by β2-Agonists and Corticosteroids on Tumor Necrosis Factor-α-Induced Interleukin-8 Release from Cultured Human Airway Smooth-Muscle Cells," Am. J. Respir. Cell Mol. Biol. 23: 79-85 (2000). Pauwels et al., "Effect of Inhaled Formoterol and Budesonide on Exacerbations of Asthma," The New England Journal of Medicine 337(20): 1405-1411 (1997). Physicians' Desk Reference: PDR, Oradell, N.J.: Medical Economics Co., pp. 535-537, 480-482, 2828-2829 (2000). Rico-Mendez et al, "Formoterol en polvo seco, dos veces al dia versus salbutamol aeroso, cuatro veces al dia, en pacientes con asma estable," Revista Alergia Mexico, XLVI(5):130-135 (1999). Ringdal et al, "Onset and duration of action of single doses of formoterol inhaled via Turbuhaler(R)," Respiratory Medicine, 92:1017-1021 (1998). Schreurs et al, "A dose-repsonse study with formoterol Turbuhaler(R) as maintenance therapy in asthmatic patients," Eur Respir J, 9:1678-1683 (1996). Seberova and Andersson, "Oxis(R) (formoterol given by Turbuhaler(R)) showed as rapid an onset of action as salbutamol given by a pMDI," Respiratory Medicine, 94:607-611 (2000). Seldon et al., "Albuterol Does Not Antagonize the Inhibitory Effect of Dexamethasone on Monocyte Cytokine Release," Am. J. Respir. Crit. Care Med. 157: 803-809 (1998). Selroos et al, "Delivery Devices for Inhaled Asthma Medication," Clin Immunother, 6:273-299 (1996). Silvestri et al., "Fluticasone and salmeterol downregulate in vitro, fibroblast proliferation and ICAM-1 or H-CAM expression," Eur. Respir. J. 18: 139-145 (2001). Sköld et al., "Glucocoticoids Augment Fibroblast-Mediated Contraction of Collagen Gels by Inhibition of Endogenous PGE Production," Proceedings of the Association of American Physicians 111(3): 249-258 (1999). Smaldone et al., "Budesonide Inhalation Suspension in Chemically Compatable With Other Nebulizing Formulations," Chest 118(4)Suppl: 98S (2000). Stewart et al., "Acute formoterol administration has no argogenic effect in nonasthmatic athletes," Medicine & Science In Sports & Exercise 34(2): 213-217 (2002). Tomioka et al, "Anti-Allergic Activities of the B-Adrenoceptor Stimulant Formoterol (BD 40A)," Arch Int Pharmacodyn, 250:279-292 (1981). Totterman et al, "Tolerability to high doses of formotereol and terbutaline via Turbuhaler(R) for 3 days in stable asthmatic patients," Eur Respir J, 12:573-579 (1998). Ullman et al. "Formoterol inhaled as dry powder or via pressurized metered-dose inhaler ina cumulative dose-response study," Allergy, 51:745-748 (1996). Vianna, E.O. and R.J. Martin, "Bronchodilators and Corticosteroids in the Treatment of Asthma," Drugs of Today 34(3): 203-223 (1998). Warne, P.J., "The discovery and clinical development of RPR 106541: an airway-selective steroid for the treatment of asthma", Emerging Drugs, 5(2):231-239 (2000). Wilding et al., "Efect of long term treatment with salmeterol on asthma control: a double blind, randomised crossover study," British Medical Journal 314: 1441-1446 (1997). Woolcock et al., "Comparison of Addition of Salmeterol to Inhaled Steroids with Doubling of the Dose of Inhaled Steroids," Am. J. Respir. Crit. Care Med. 153: 1481-1488 (1996). ES2319887T3 (en) 2009-05-14 Superfine formulation of salmeterol. Free format text: CLAIMS 1, 21-25, 38-42, 74, 94-98 AND 111-115 ARE DETERMINED TO BE PATENTABLE AS AMENDED. CLAIMS 2-20, 26-37, 57-63, 75, 76, 77-93, 99-110, 120-124 AND 130-136 DEPENDENT ON AN AMENDED CLAIM, ARE DETERMINED TO BE PATENTABLE. NEW CLAIMS 147-163 ARE ADDED AND DETERMINED TO BE PATENTABLE. CLAIMS 43-56, 64-73, 116-119, 125-129 AND 137-146 WERE NOT REEXAMINED.